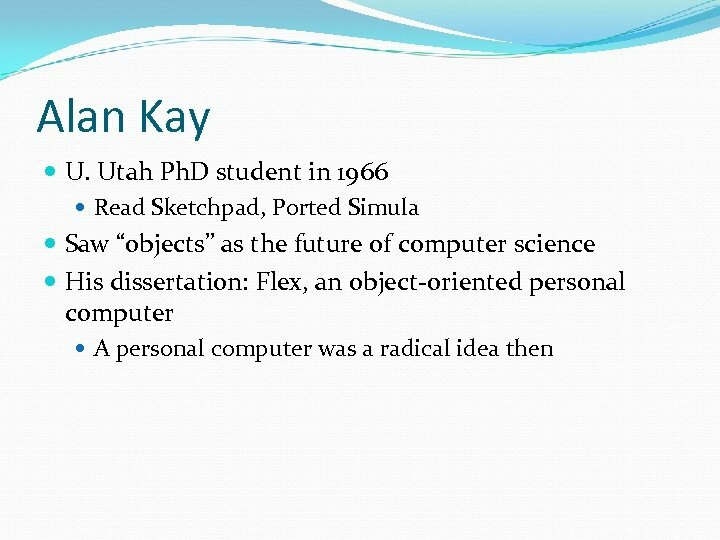 Kay's Insights “Computer” as collection of Networked Computers All software is simulating the real world Biology as model for objects Bacterium has 120 M of info, 1/500 th of a Cell, and we have 1013 of these in us. Talk about processing power! Talk about managing complexity! What man-made things can scale like that? Stick a million dog houses together to get the Empire State Building? 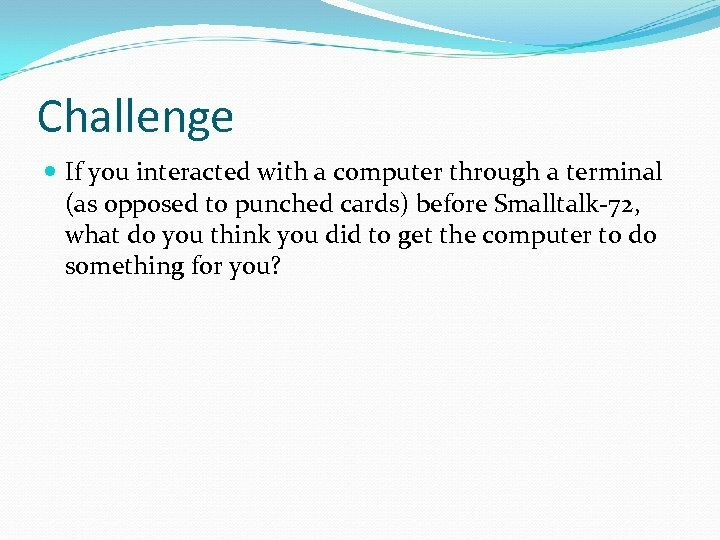 Challenge If you interacted with a computer through a terminal (as opposed to punched cards) before Smalltalk-72, what do you think you did to get the computer to do something for you? 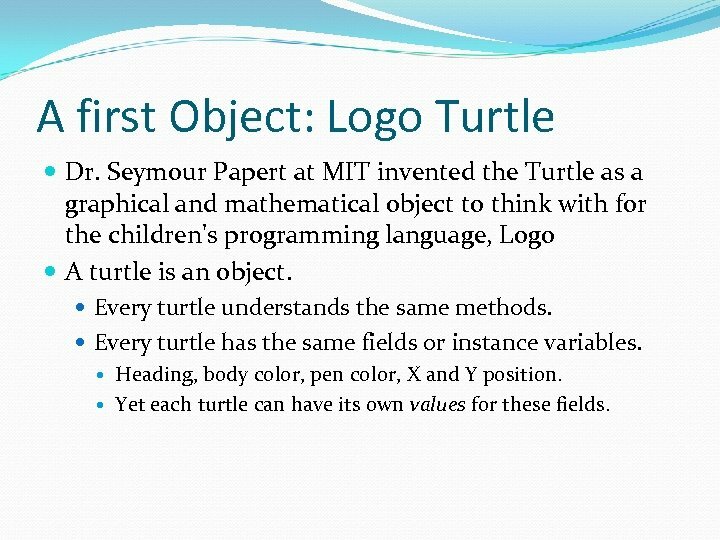 A first Object: Logo Turtle Dr. Seymour Papert at MIT invented the Turtle as a graphical and mathematical object to think with for the children's programming language, Logo A turtle is an object. 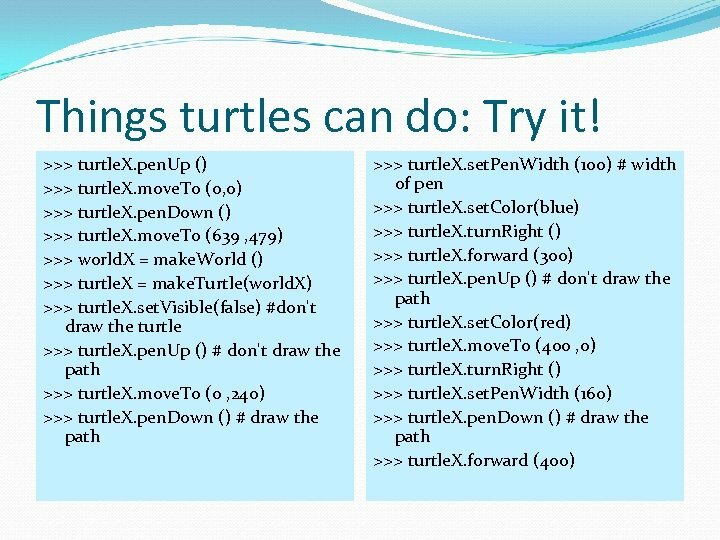 Every turtle understands the same methods. 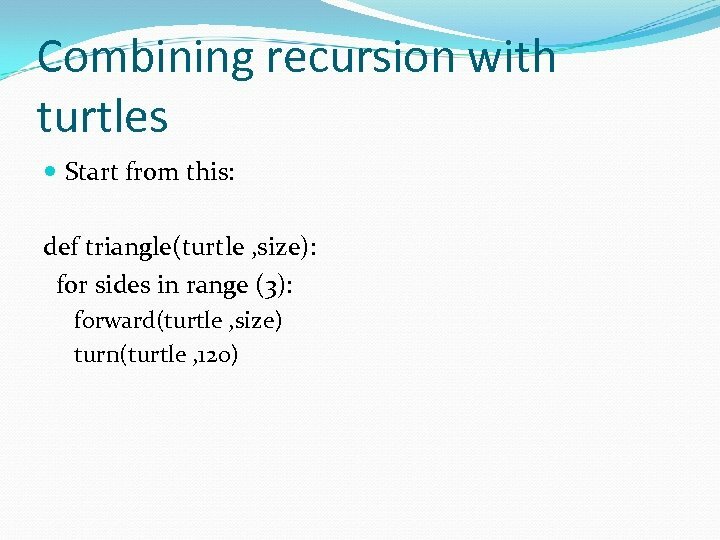 Every turtle has the same fields or instance variables. Heading, body color, pen color, X and Y position. Yet each turtle can have its own values for these fields. 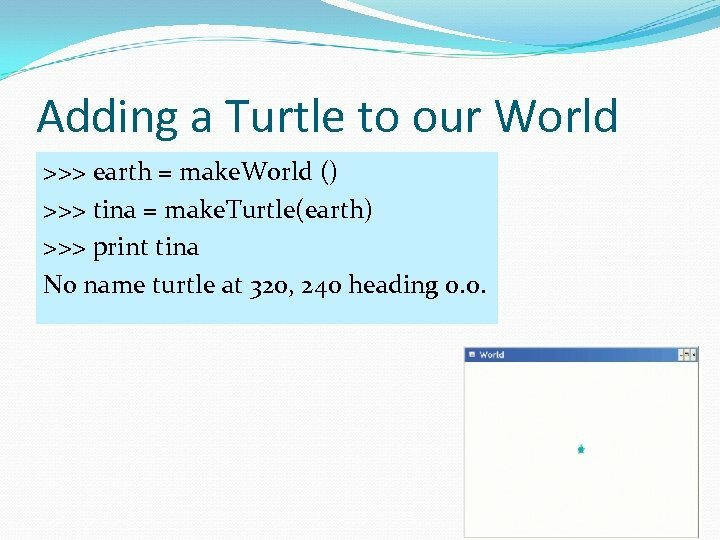 Adding a Turtle to our World >>> earth = make. 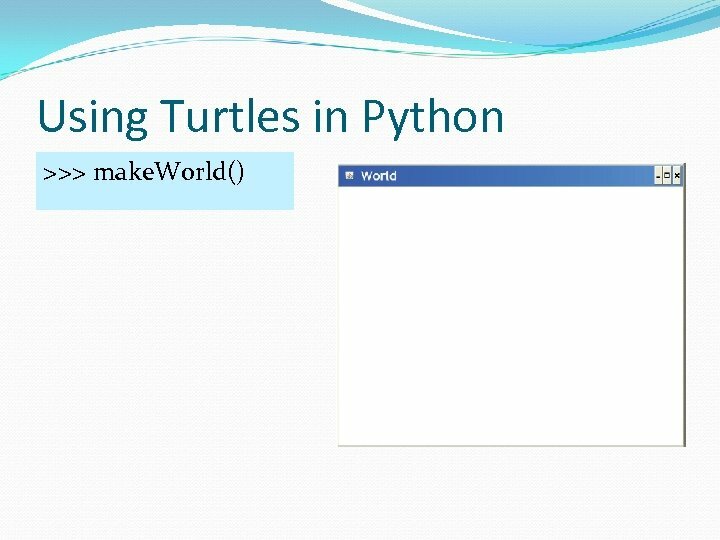 World () >>> tina = make. Turtle(earth) >>> print tina No name turtle at 320, 240 heading 0. 0. Challenge: What do these draw? >>> earth = make. 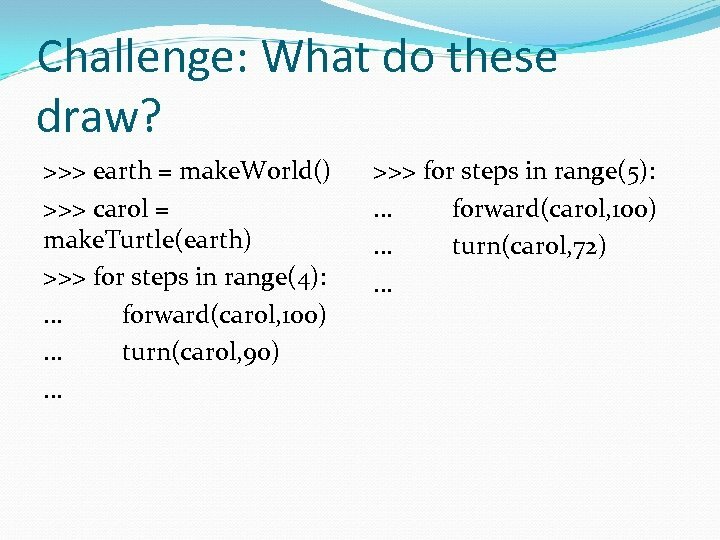 World() >>> carol = make. 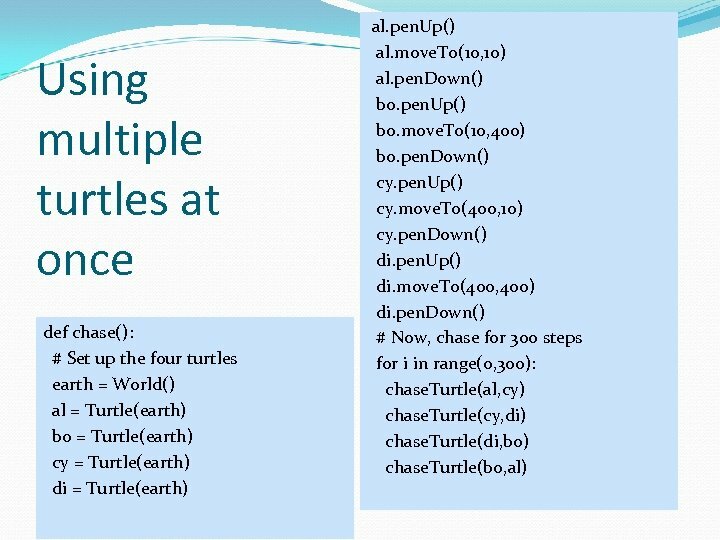 Turtle(earth) >>> for steps in range(4): . . . forward(carol, 100). . . turn(carol, 90). . . >>> for steps in range(5): . . . forward(carol, 100). . . turn(carol, 72). . . 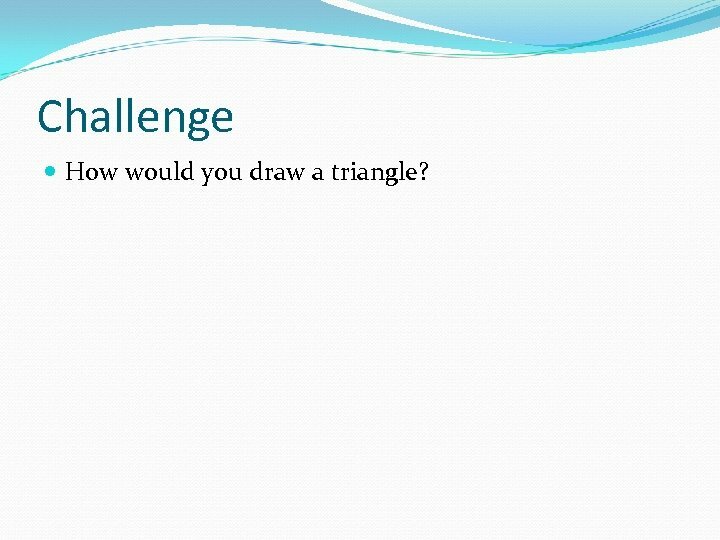 Challenge How would you draw a triangle? 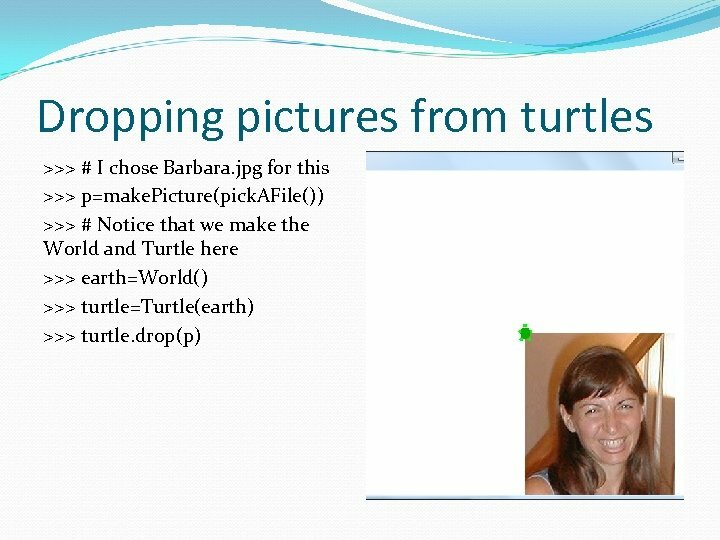 Sending multiple turtles messages >>> sue = make. 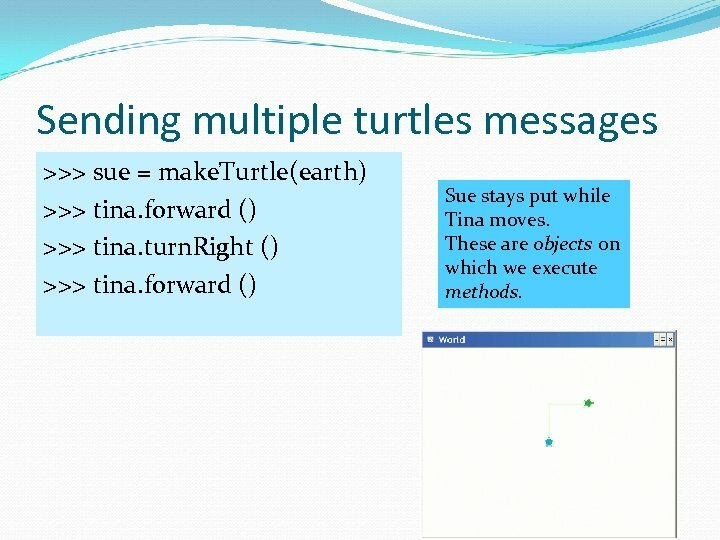 Turtle(earth) >>> tina. 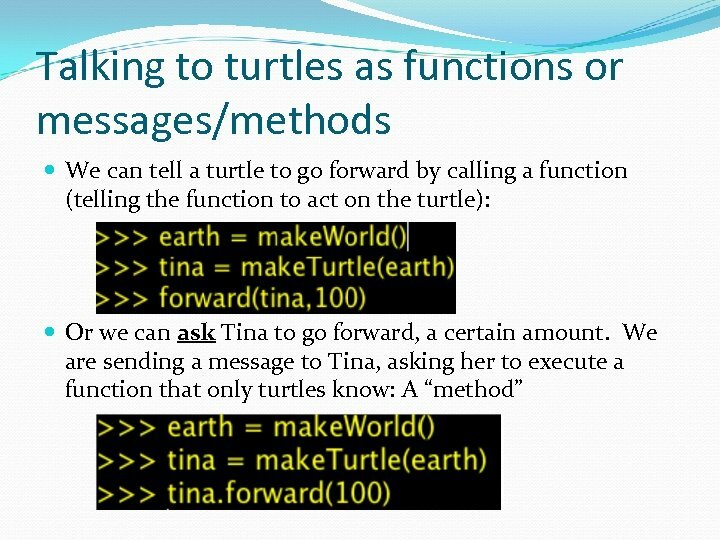 forward () >>> tina. turn. Right () >>> tina. forward () Sue stays put while Tina moves. 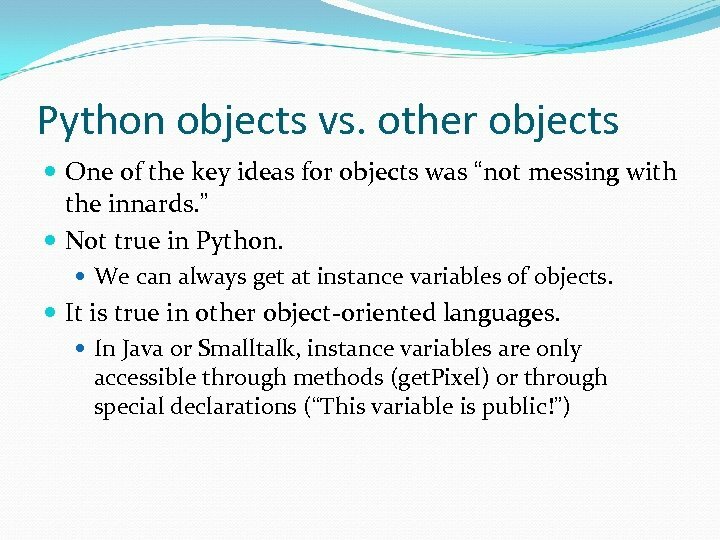 These are objects on which we execute methods. 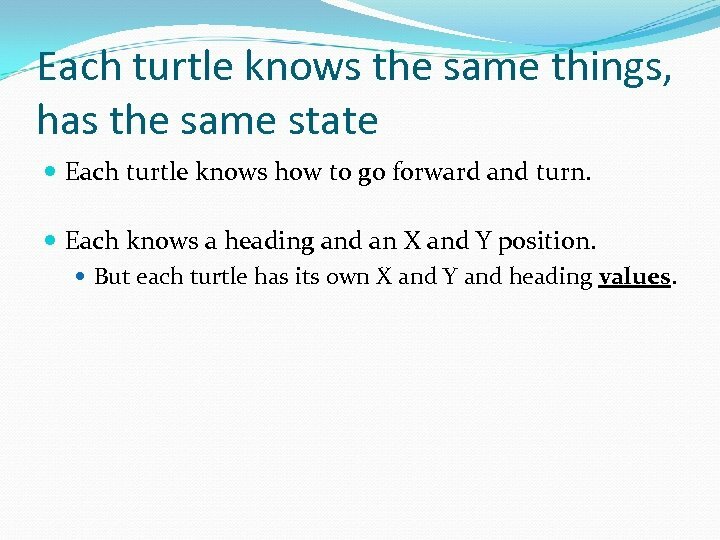 Each turtle knows the same things, has the same state Each turtle knows how to go forward and turn. 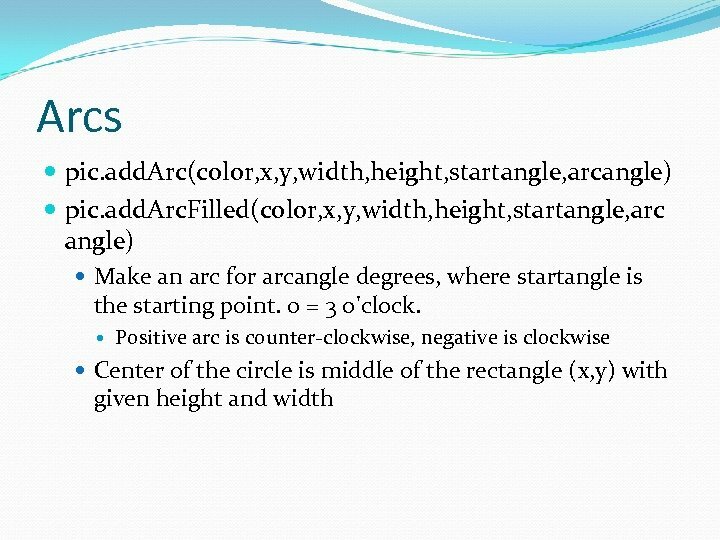 Each knows a heading and an X and Y position. 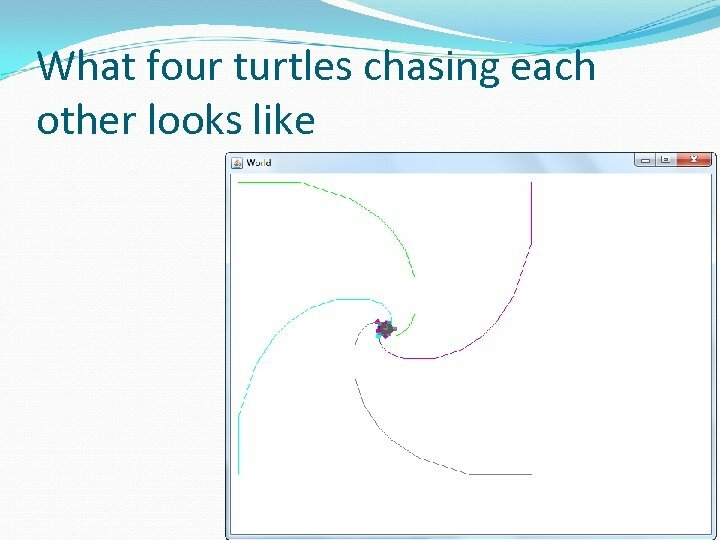 But each turtle has its own X and Y and heading values. What shape does this draw? 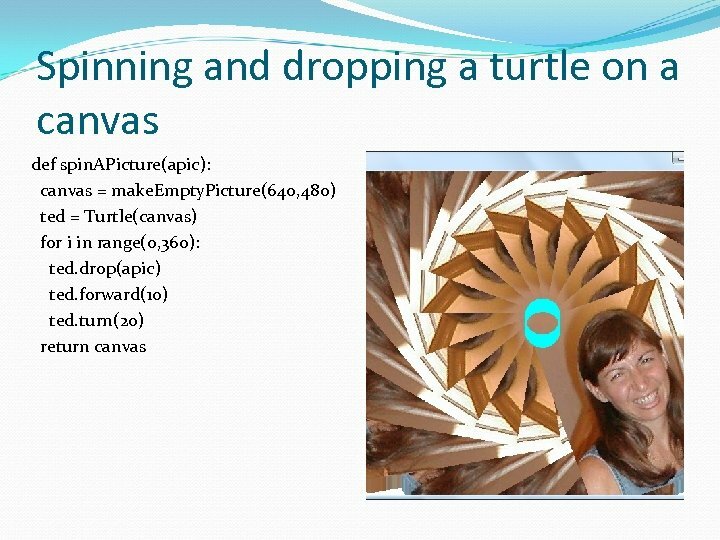 (1) A square with sides of 200 (2) A set of spikes (3) A circle (4) Error – you can’t have 600 turtles. 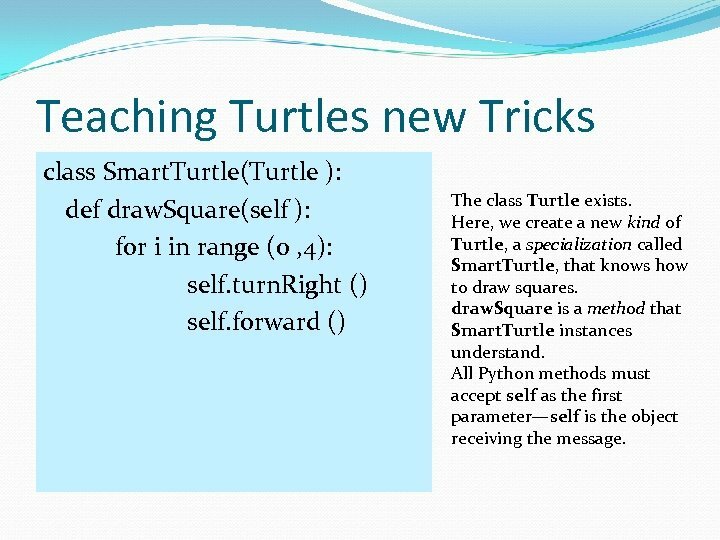 Teaching Turtles new Tricks class Smart. Turtle(Turtle ): def draw. Square(self ): for i in range (0 , 4): self. turn. Right () self. 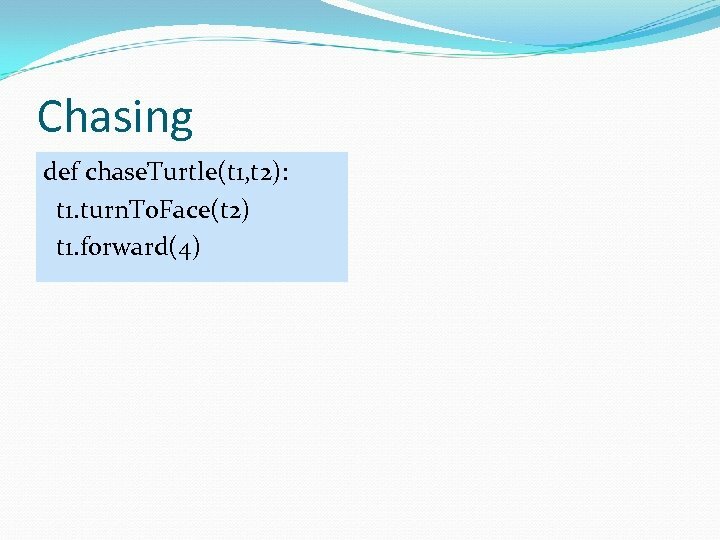 forward () The class Turtle exists. 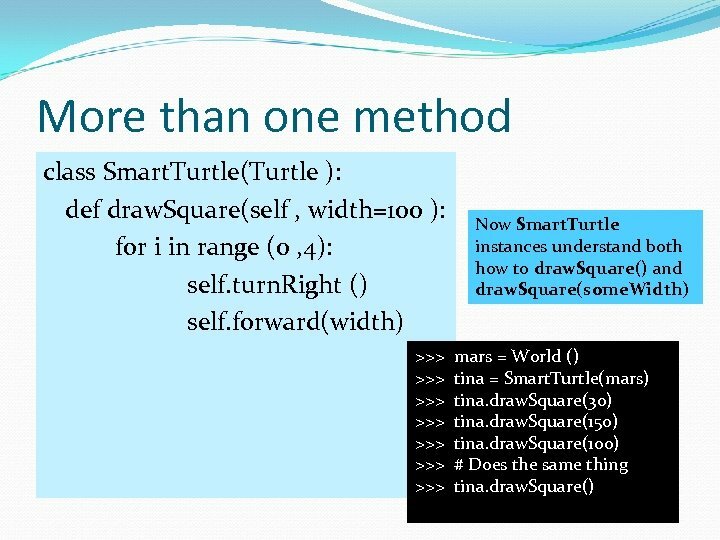 Here, we create a new kind of Turtle, a specialization called Smart. 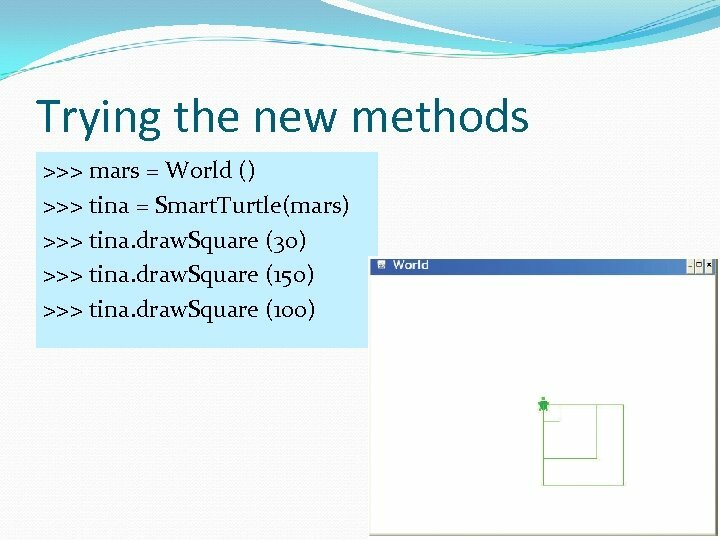 Turtle, that knows how to draw squares. draw. 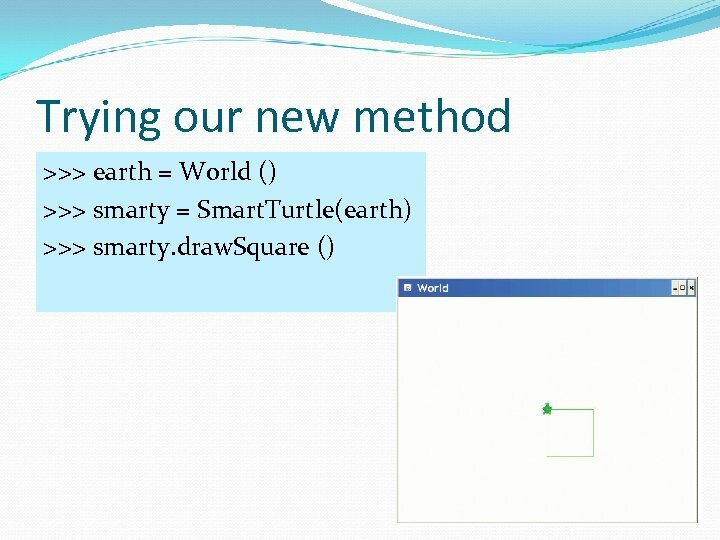 Square is a method that Smart. 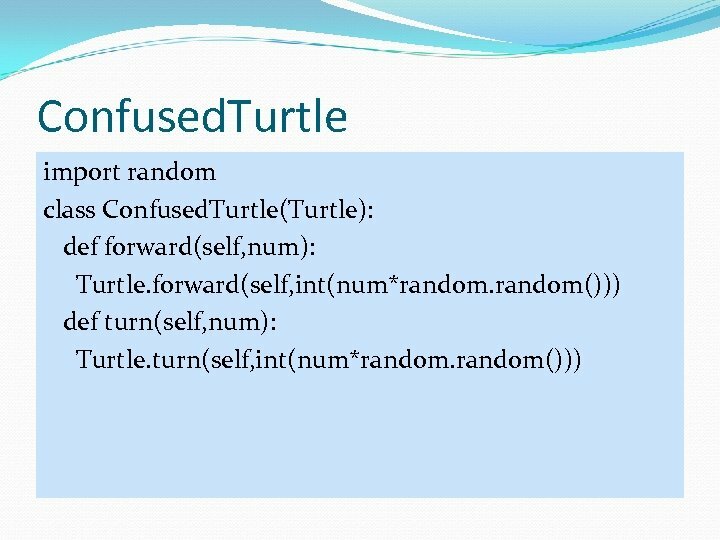 Turtle instances understand. 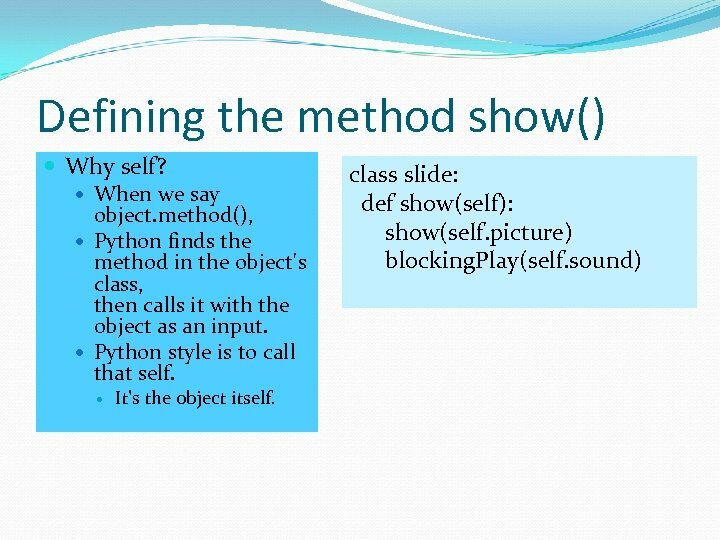 All Python methods must accept self as the first parameter—self is the object receiving the message. 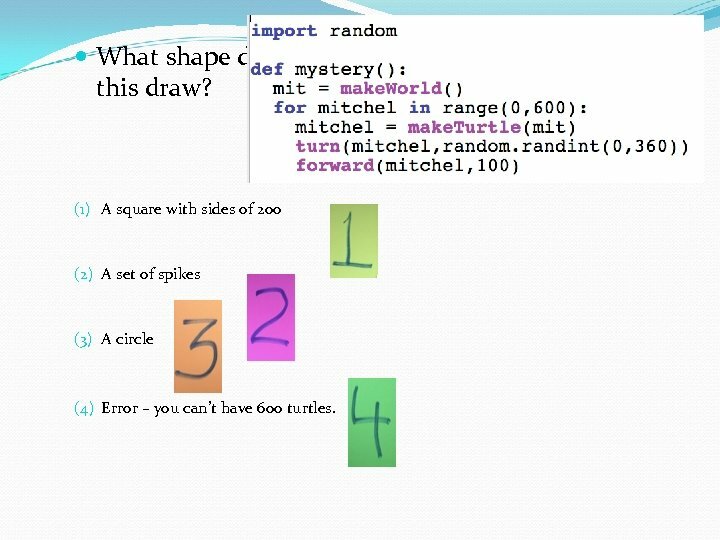 Challenge Write the method draw. 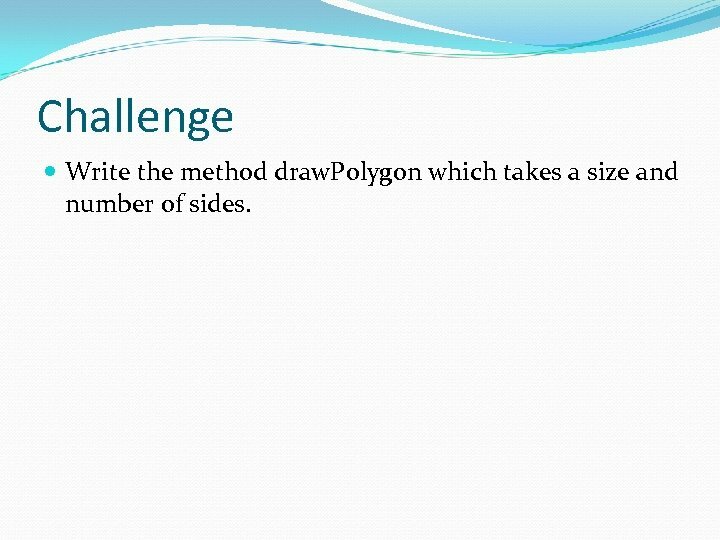 Polygon which takes a size and number of sides. 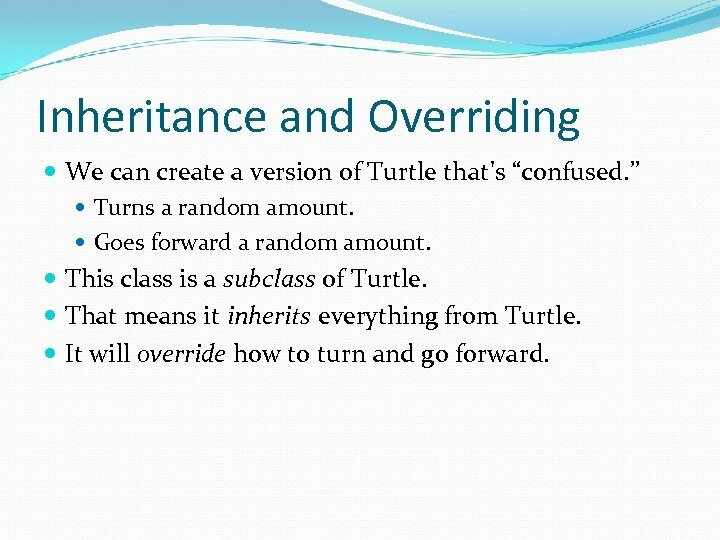 Inheritance and Overriding We can create a version of Turtle that's “confused. ” Turns a random amount. Goes forward a random amount. 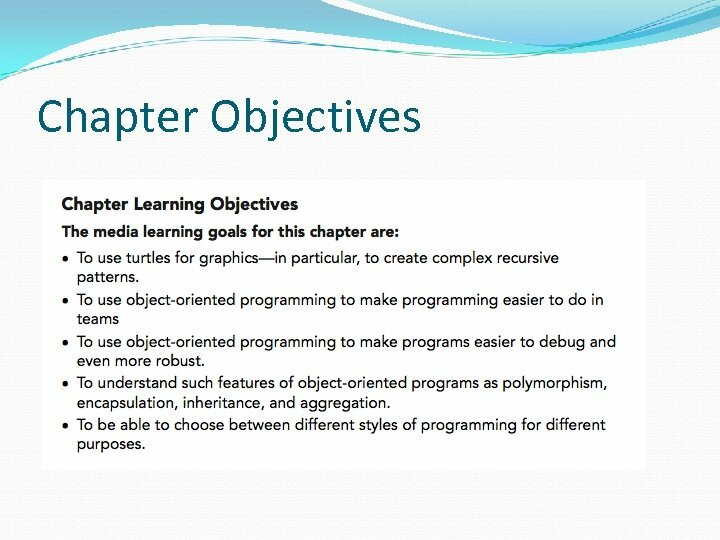 This class is a subclass of Turtle. That means it inherits everything from Turtle. It will override how to turn and go forward. 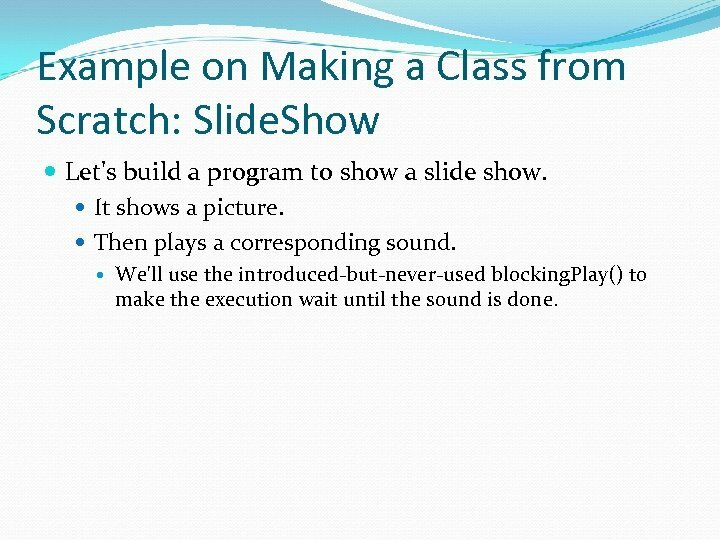 Example on Making a Class from Scratch: Slide. 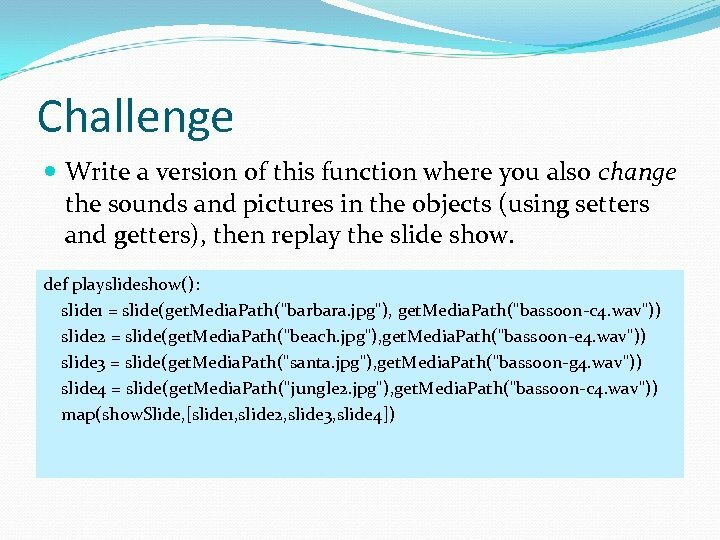 Show Let's build a program to show a slide show. It shows a picture. Then plays a corresponding sound. We'll use the introduced-but-never-used blocking. Play() to make the execution wait until the sound is done. What's wrong with this? 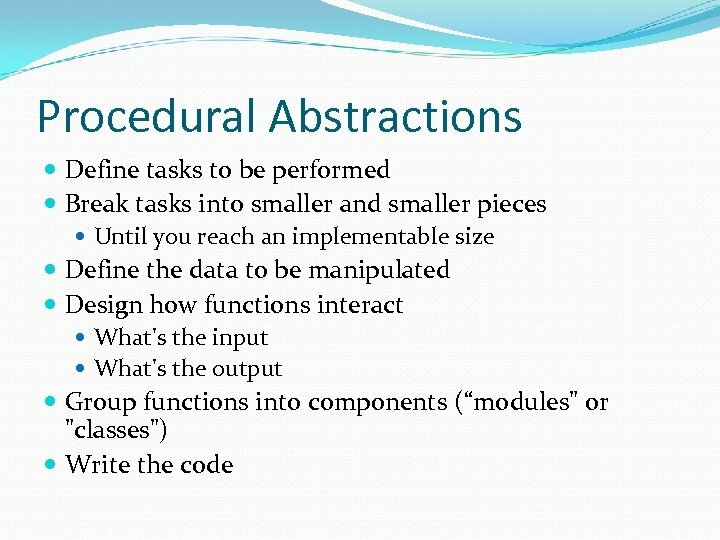 From Procedural Abstraction: We have duplicated code. We should get rid of it. 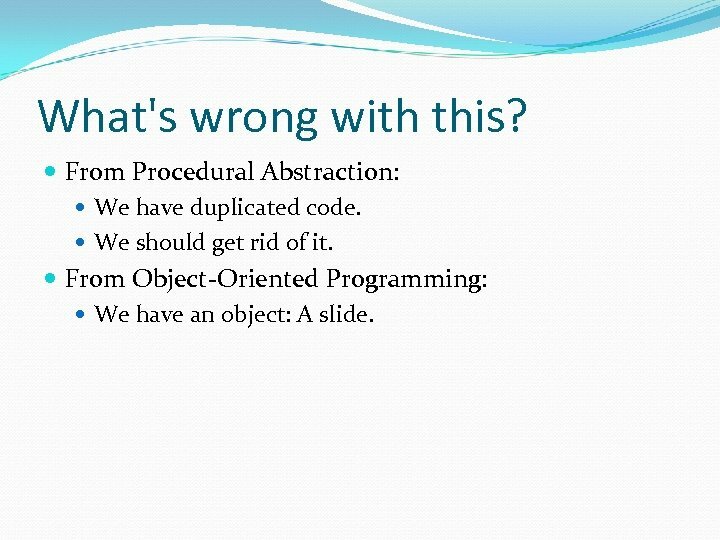 From Object-Oriented Programming: We have an object: A slide. 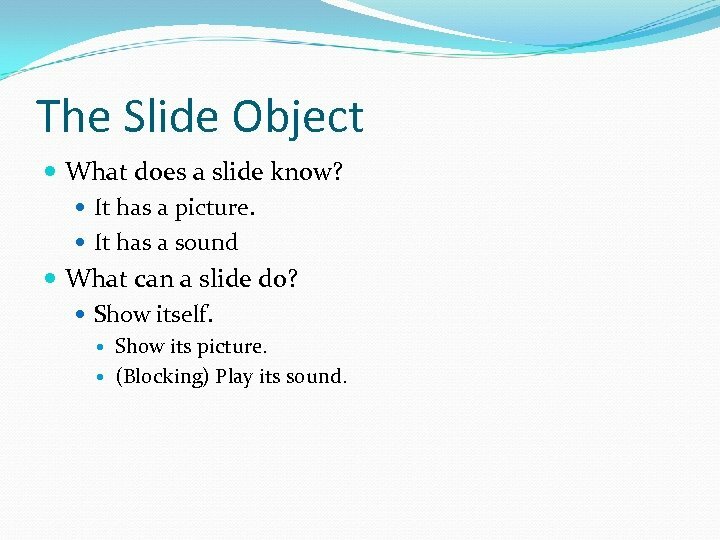 The Slide Object What does a slide know? It has a picture. It has a sound What can a slide do? Show itself. Show its picture. (Blocking) Play its sound. 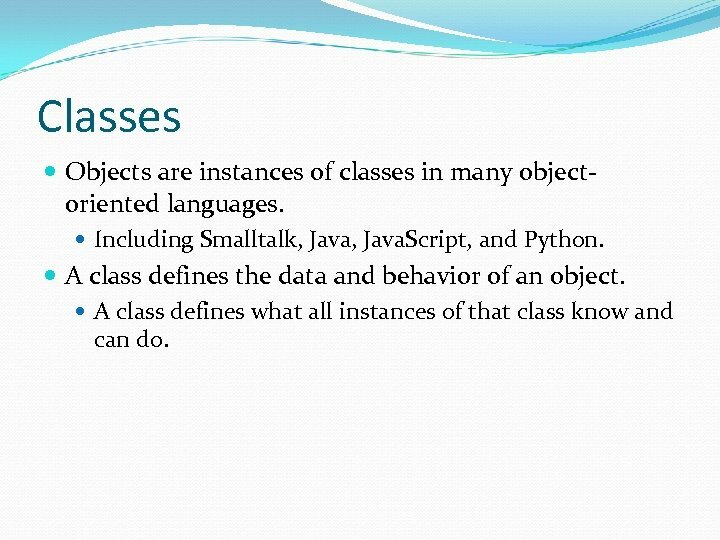 Classes Objects are instances of classes in many objectoriented languages. 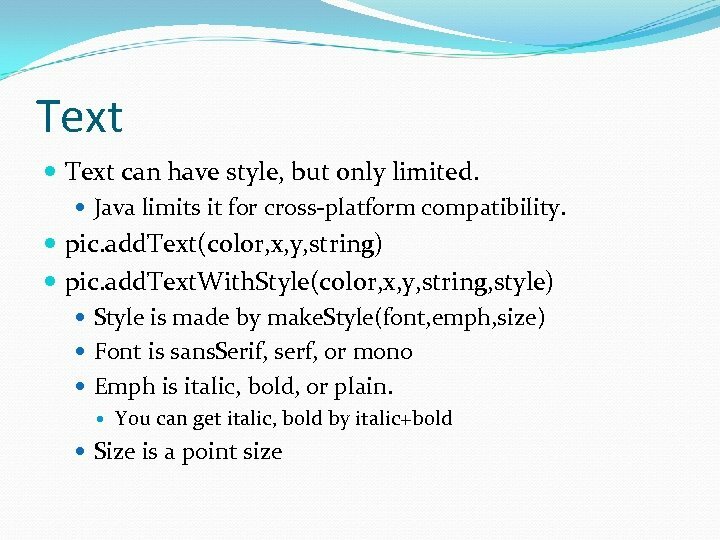 Including Smalltalk, Java. 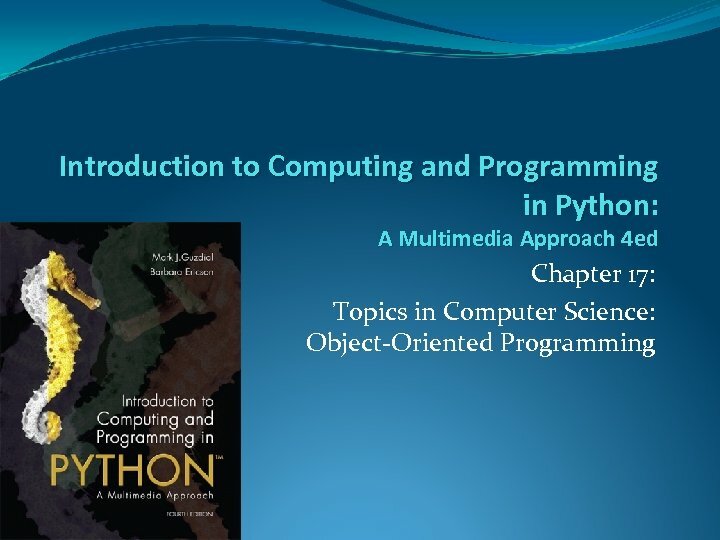 Script, and Python. 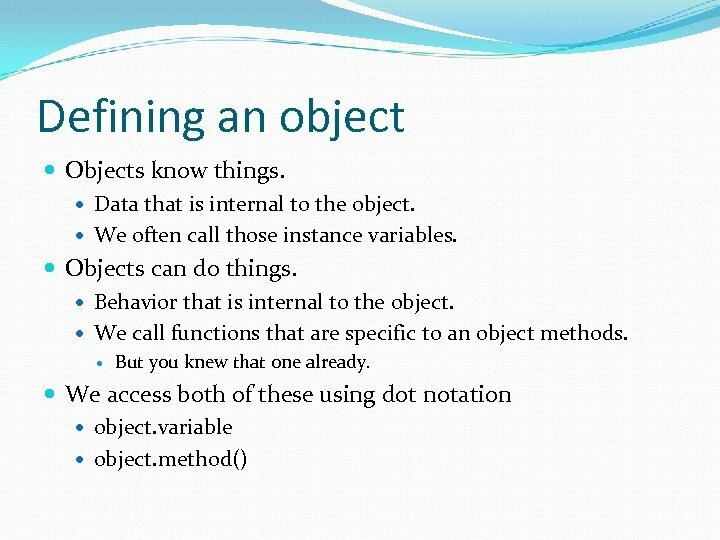 A class defines the data and behavior of an object. 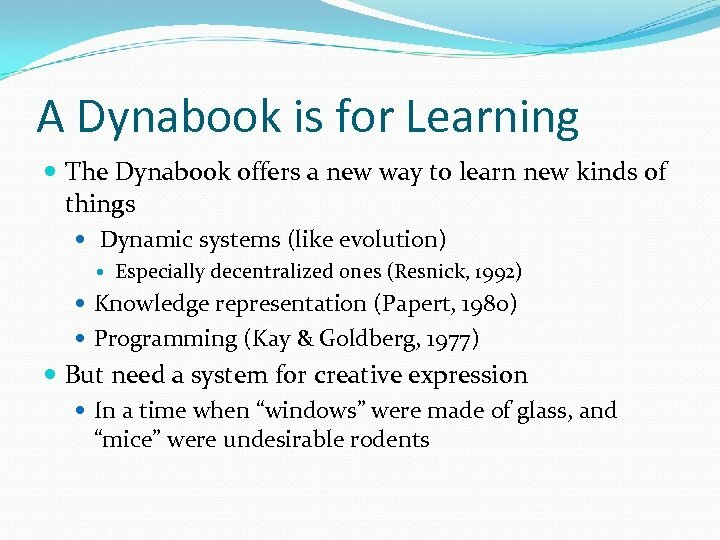 A class defines what all instances of that class know and can do. 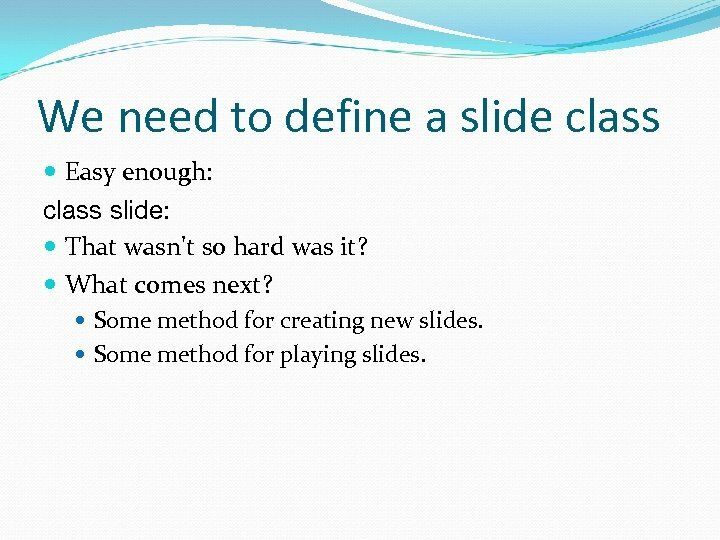 We need to define a slide class Easy enough: class slide: That wasn't so hard was it? What comes next? 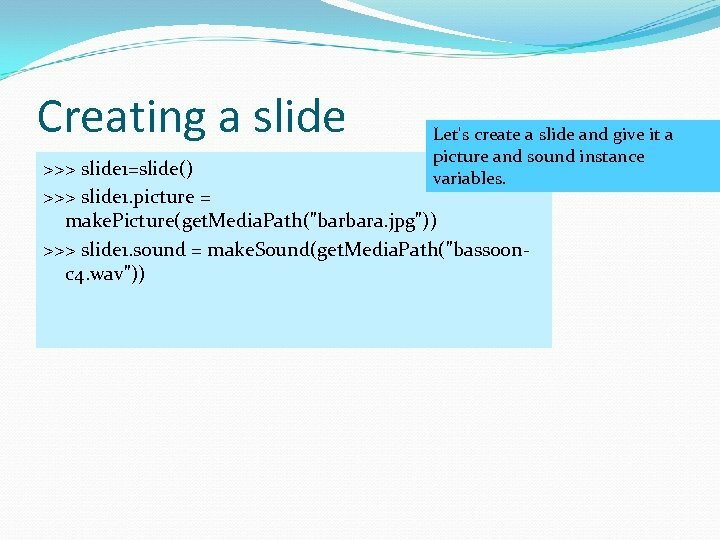 Some method for creating new slides. 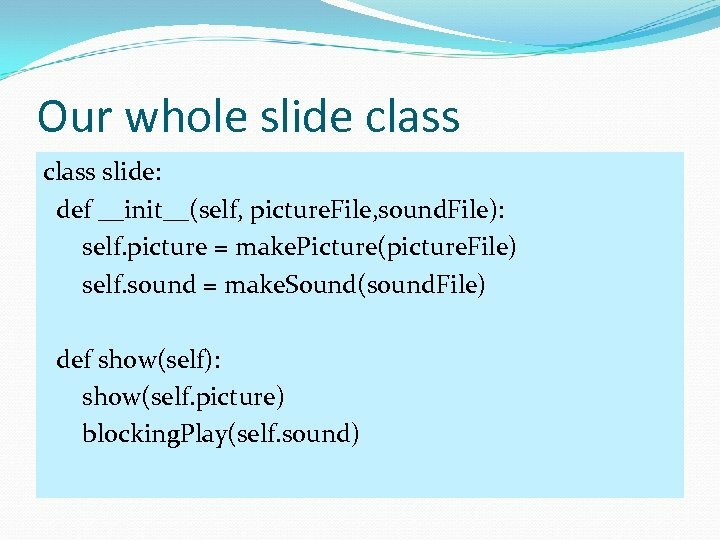 Some method for playing slides. 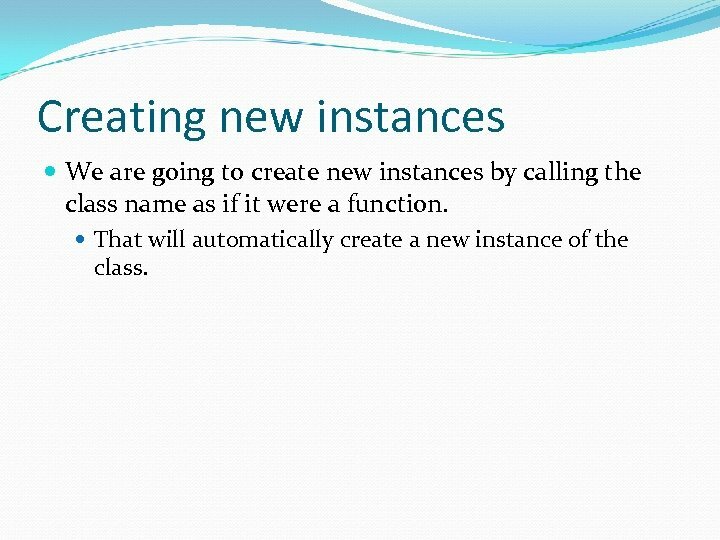 Creating new instances We are going to create new instances by calling the class name as if it were a function. 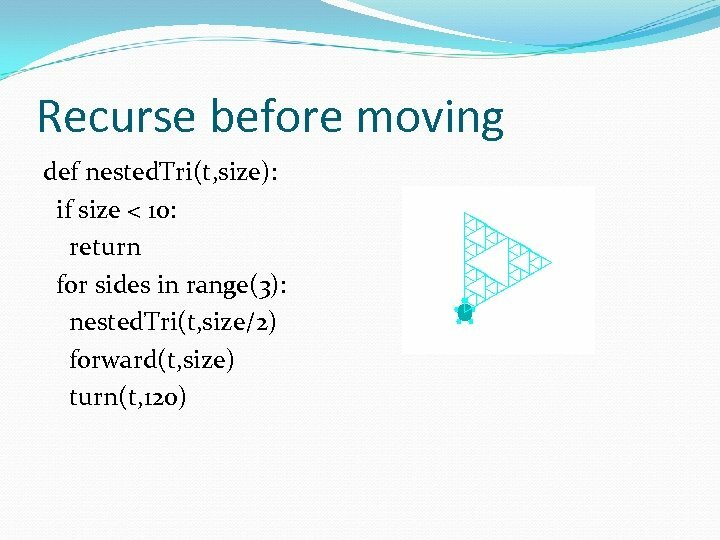 That will automatically create a new instance of the class. 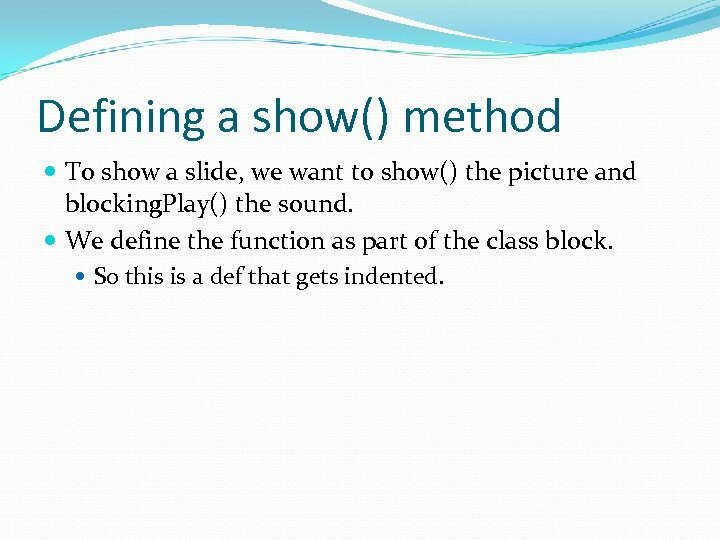 Defining a show() method To show a slide, we want to show() the picture and blocking. Play() the sound. 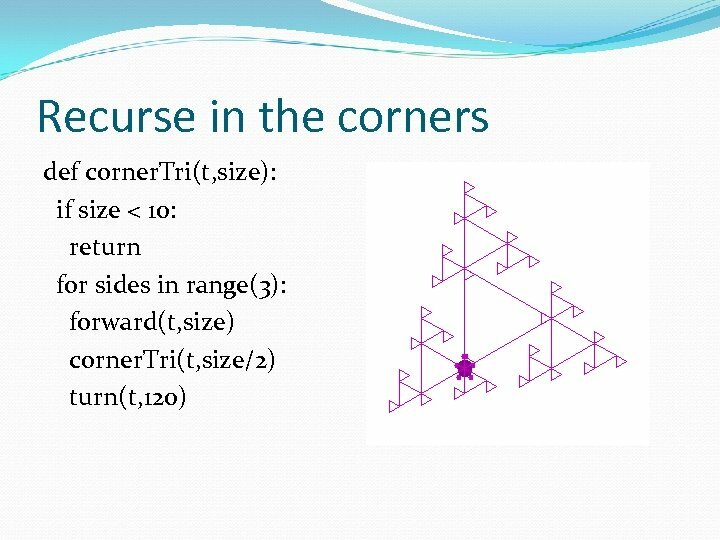 We define the function as part of the class block. So this is a def that gets indented. 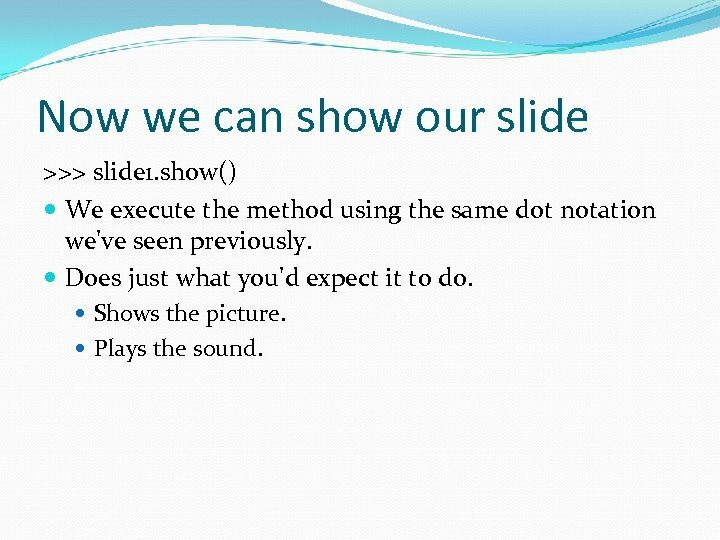 Now we can show our slide >>> slide 1. show() We execute the method using the same dot notation we've seen previously. Does just what you'd expect it to do. Shows the picture. Plays the sound. Making it simpler Can we get rid of those picture and sound assignments? 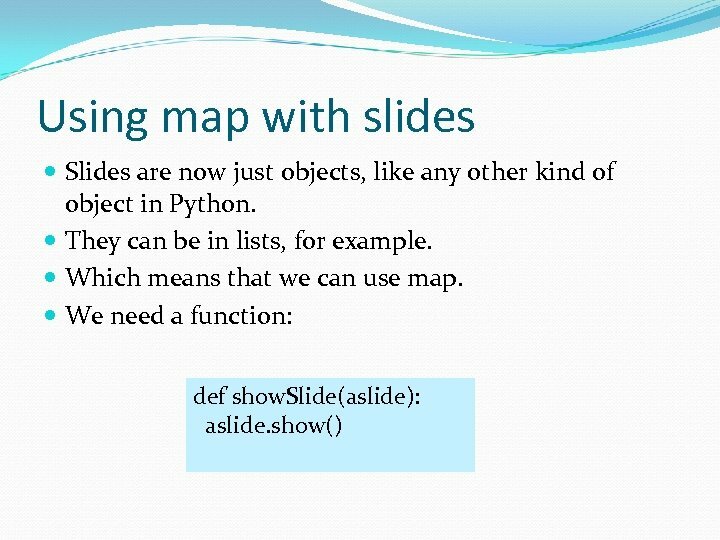 What if we could call slide as if it were a real function, with inputs? Then we could pass in the picture and sound filenames as inputs. 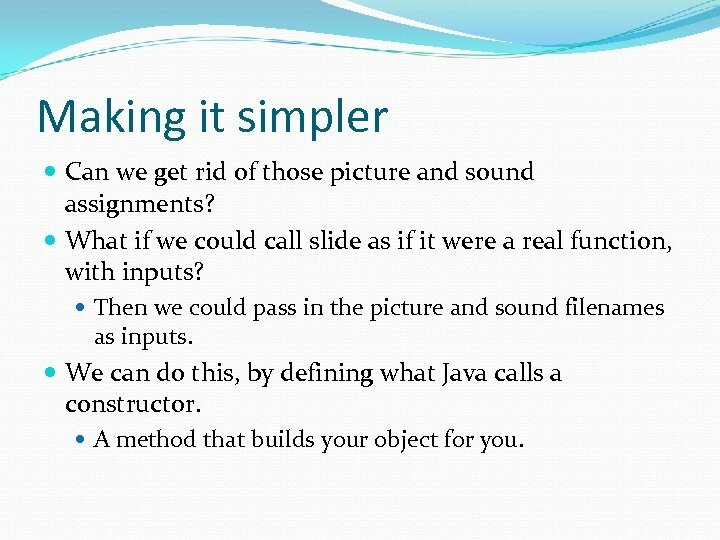 We can do this, by defining what Java calls a constructor. 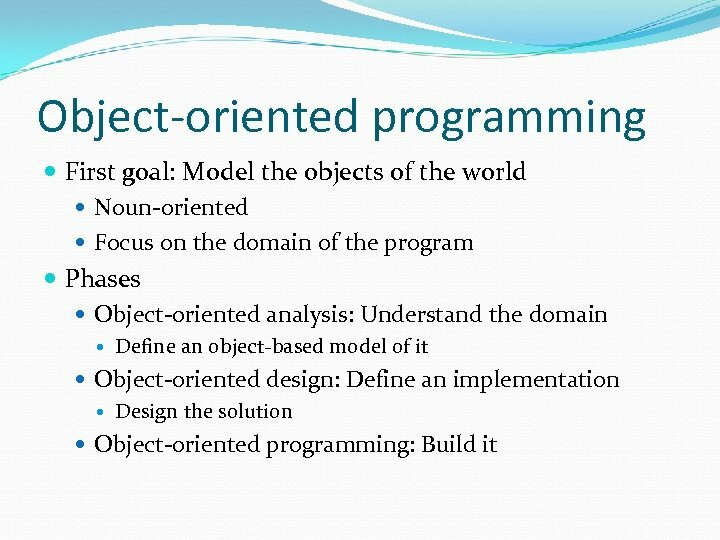 A method that builds your object for you. Making instances more flexibly To create new instances with inputs, we must define a function named __init__ That's underscore-i-n-i-t-underscore. 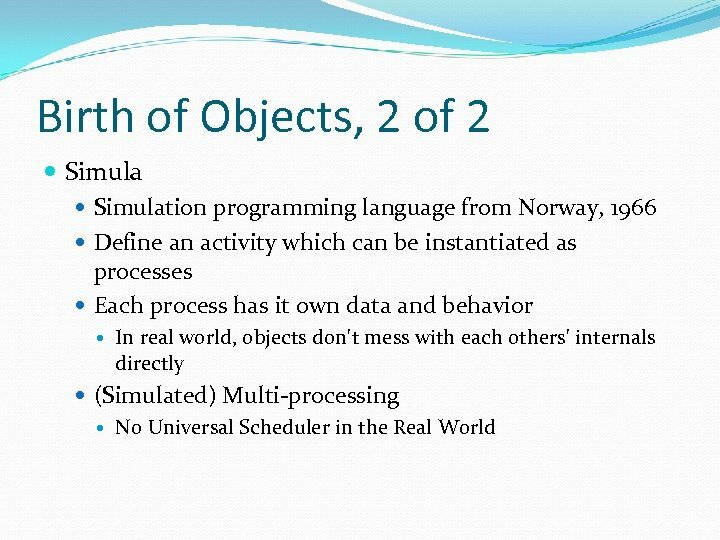 It's the predefined name for a method that initializes new objects. 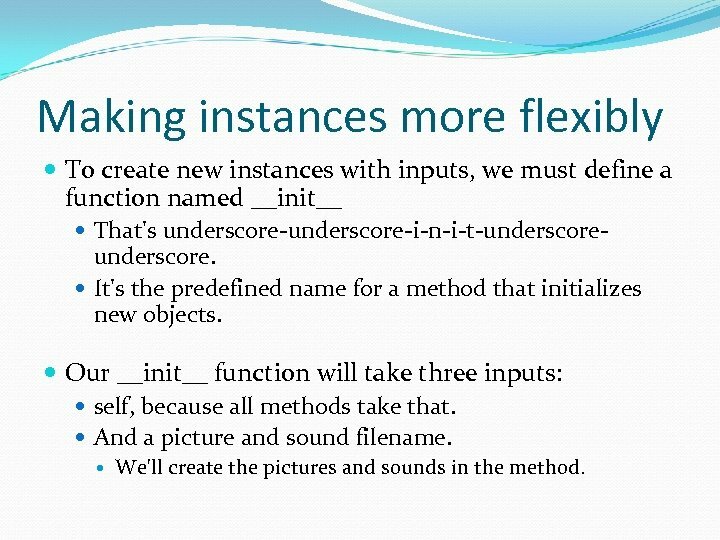 Our __init__ function will take three inputs: self, because all methods take that. And a picture and sound filename. 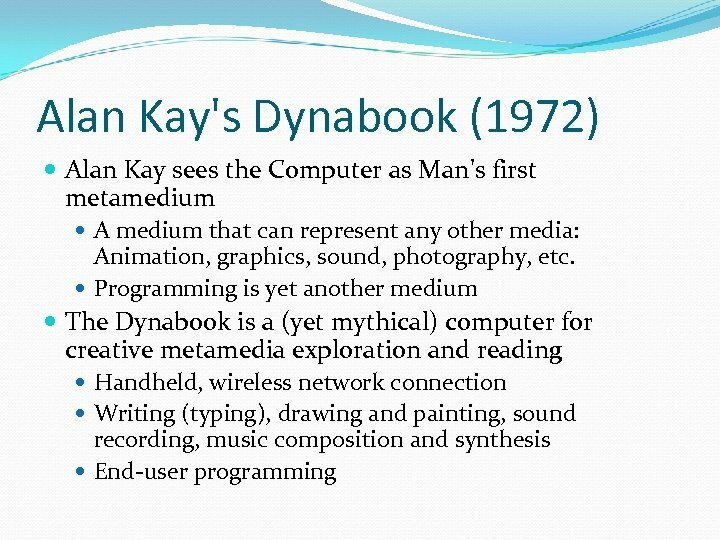 We'll create the pictures and sounds in the method. 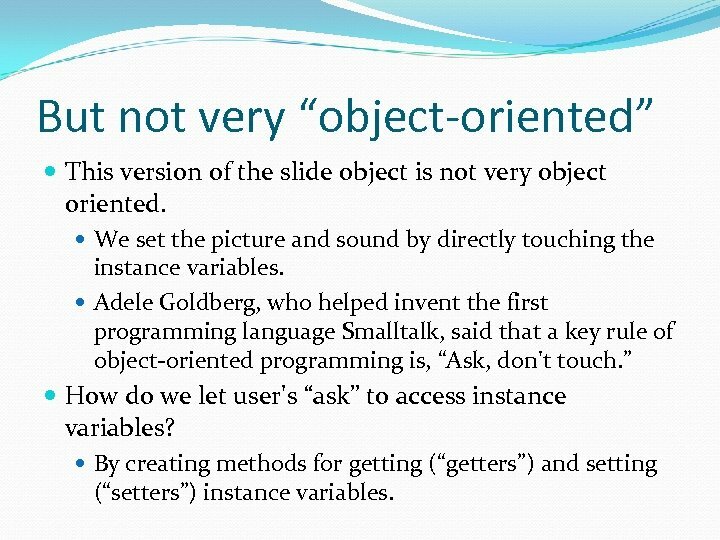 But not very “object-oriented” This version of the slide object is not very object oriented. 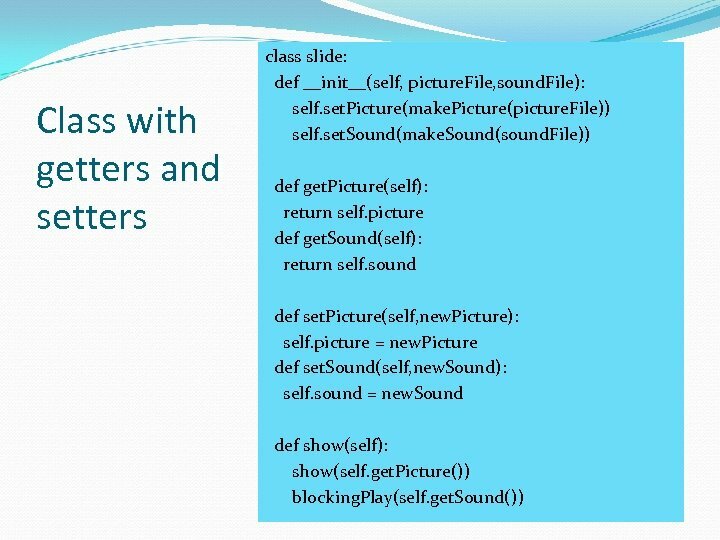 We set the picture and sound by directly touching the instance variables. 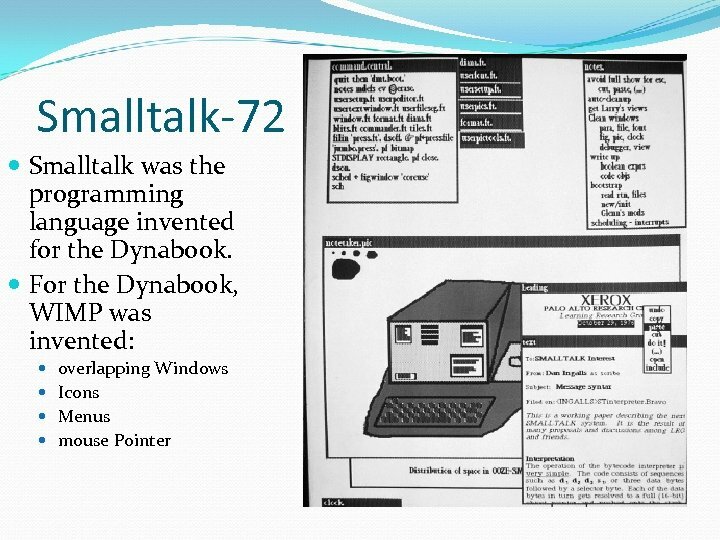 Adele Goldberg, who helped invent the first programming language Smalltalk, said that a key rule of object-oriented programming is, “Ask, don't touch. ” How do we let user's “ask” to access instance variables? By creating methods for getting (“getters”) and setting (“setters”) instance variables. 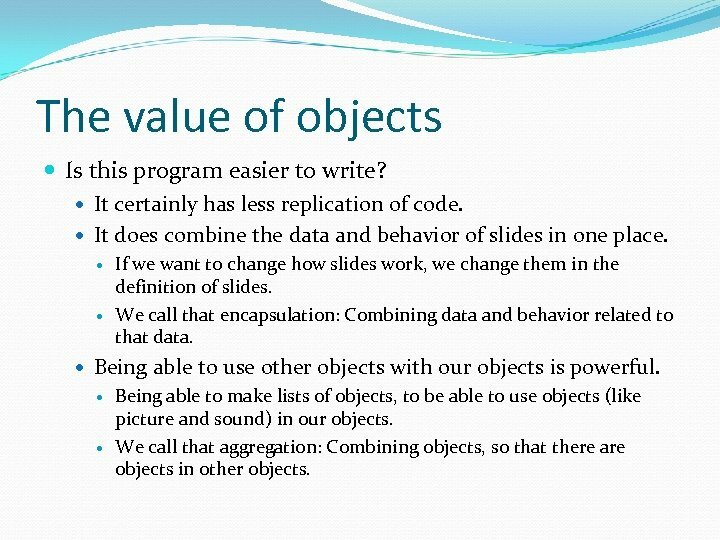 The value of objects Is this program easier to write? 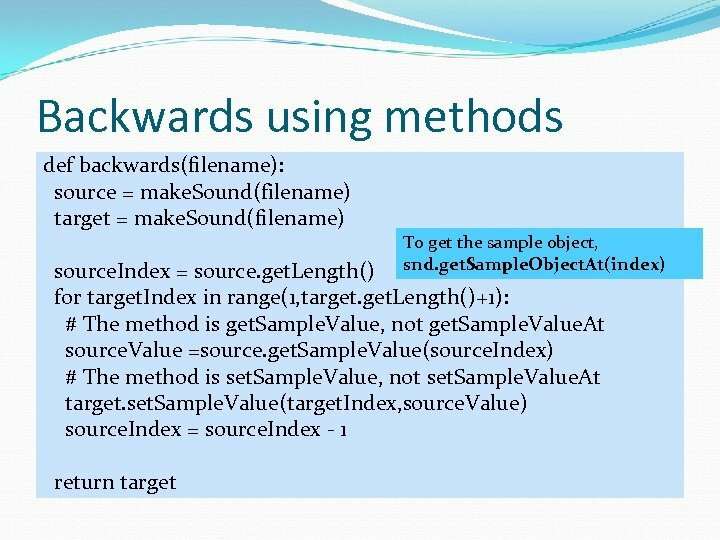 It certainly has less replication of code. 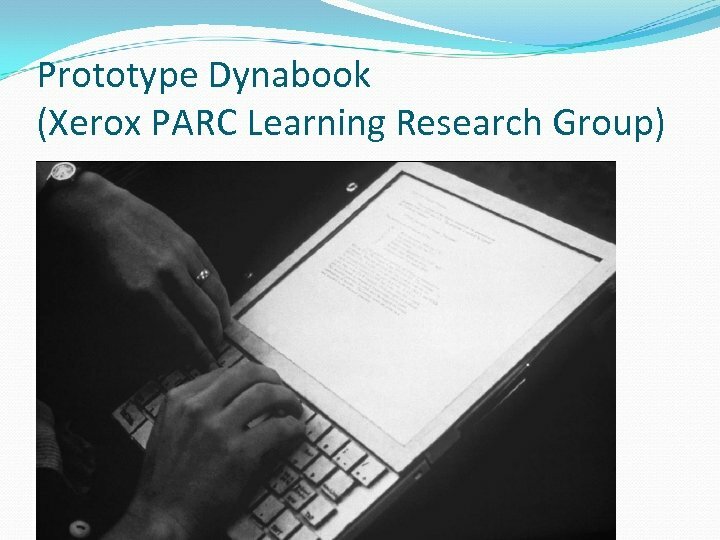 It does combine the data and behavior of slides in one place. 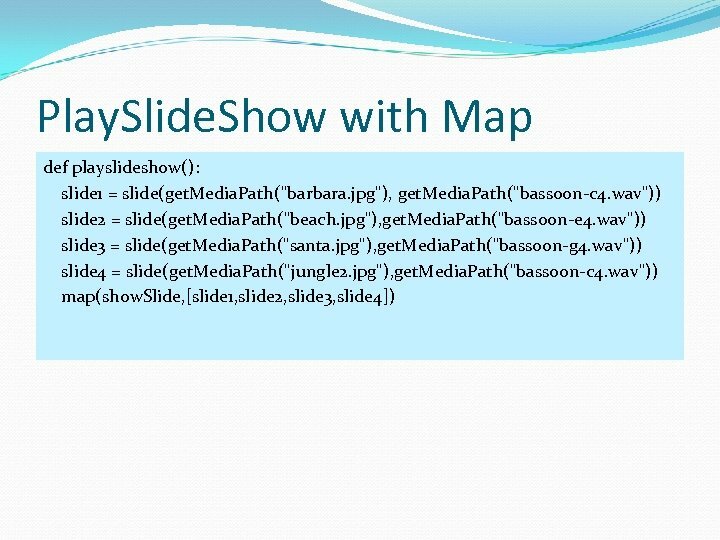 If we want to change how slides work, we change them in the definition of slides. 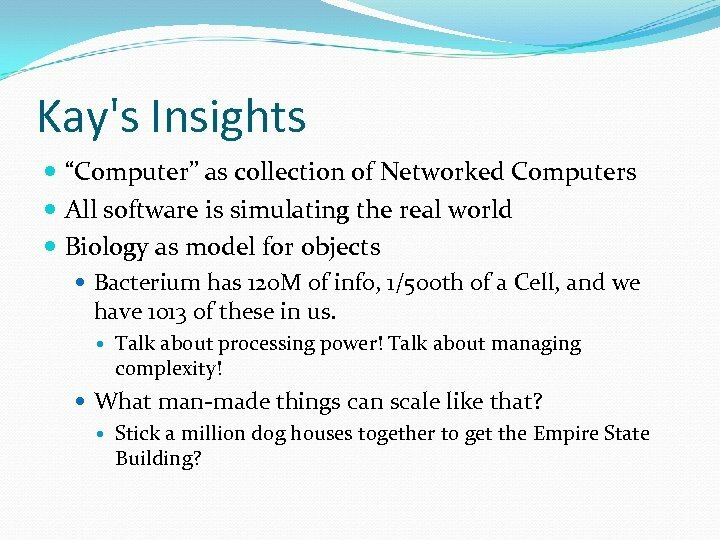 We call that encapsulation: Combining data and behavior related to that data. Being able to use other objects with our objects is powerful. 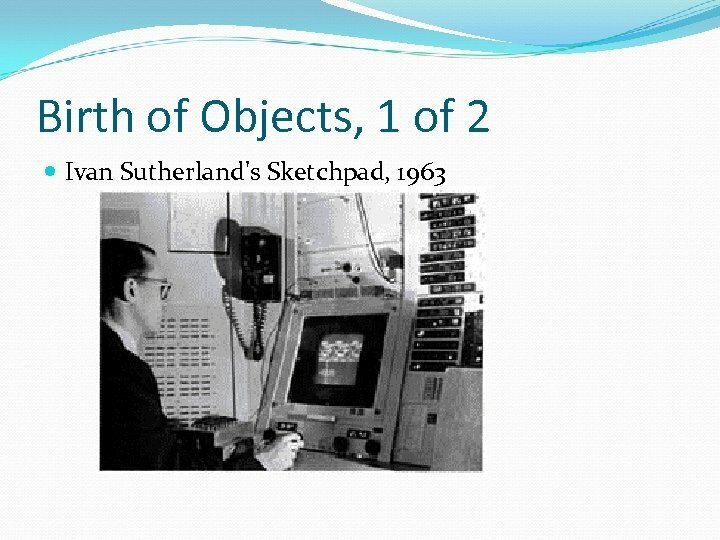 Being able to make lists of objects, to be able to use objects (like picture and sound) in our objects. 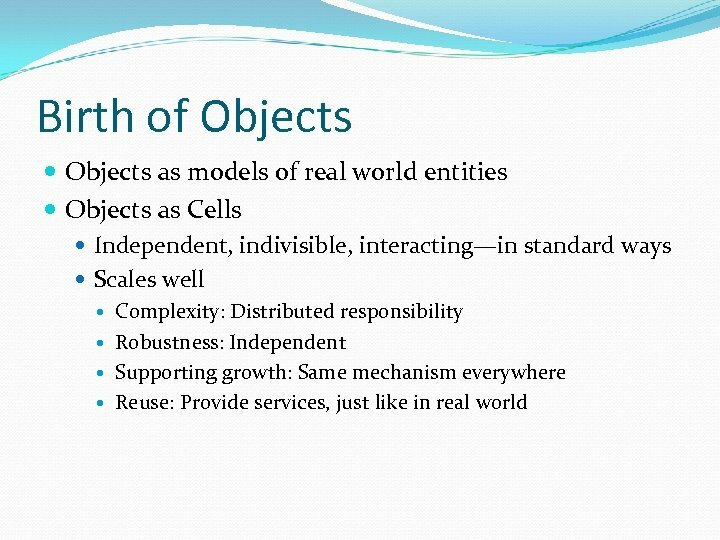 We call that aggregation: Combining objects, so that there are objects in other objects. We've been doing this already, of course. 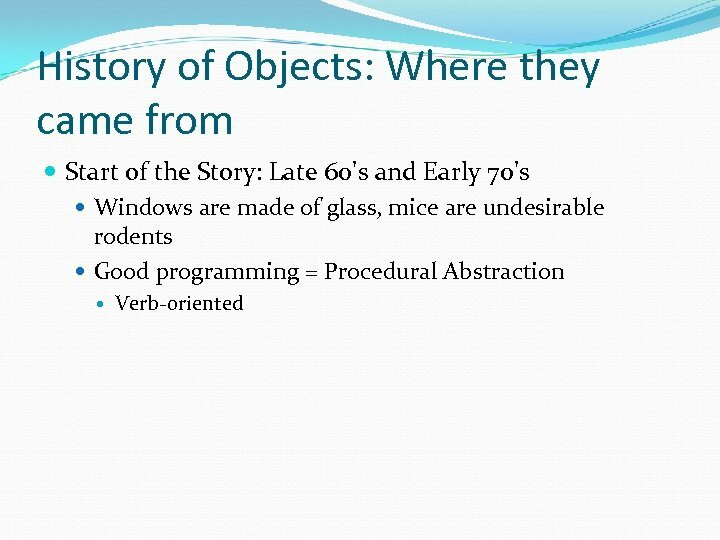 You've been using objects already, everywhere. Pictures, sounds, samples, colors—these are all objects. We've been doing aggregation. 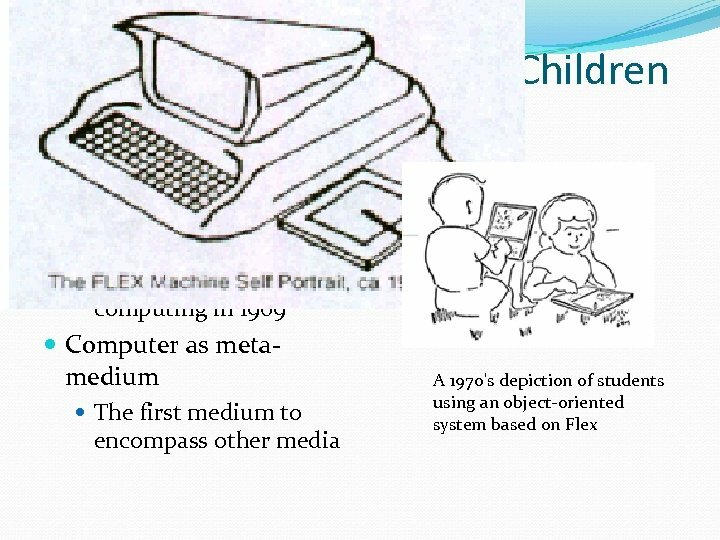 We've worked with or talked about lists of pictures, sounds, pixels, and samples The functions that we've been providing merely cover up the underlying objects. 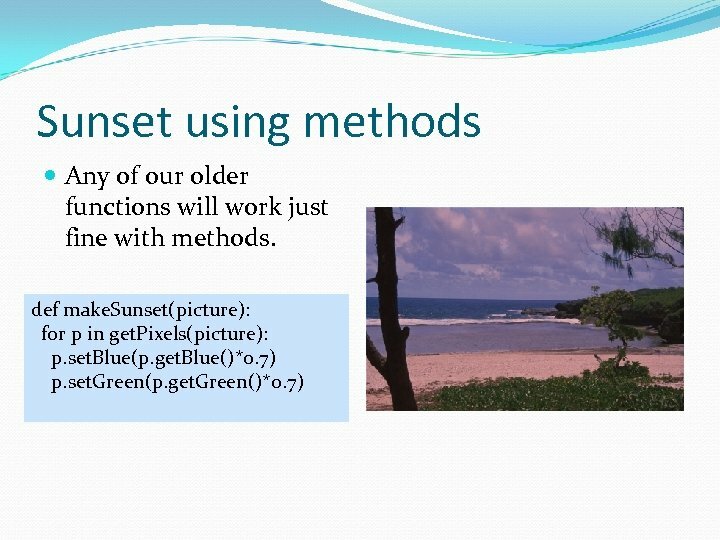 Slides and pictures both show() Did you notice that we can say slide 1. show() and pic. show()? 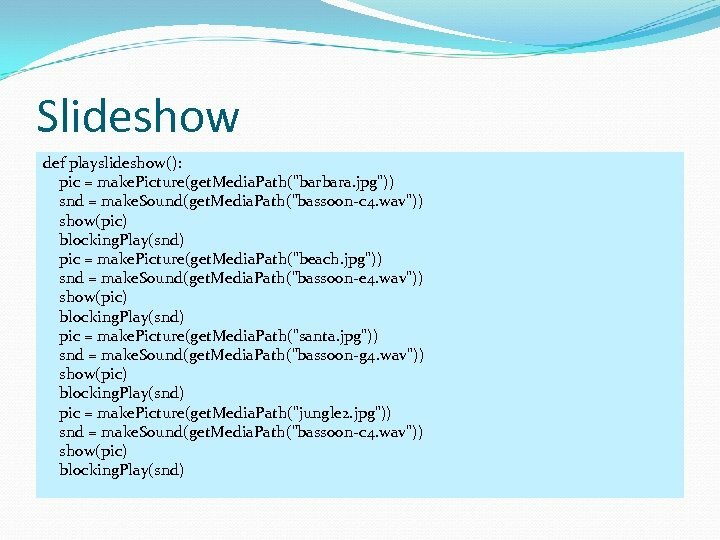 Show() generally means, in both contexts, “show the object. ” But what's really happening is different in each context! 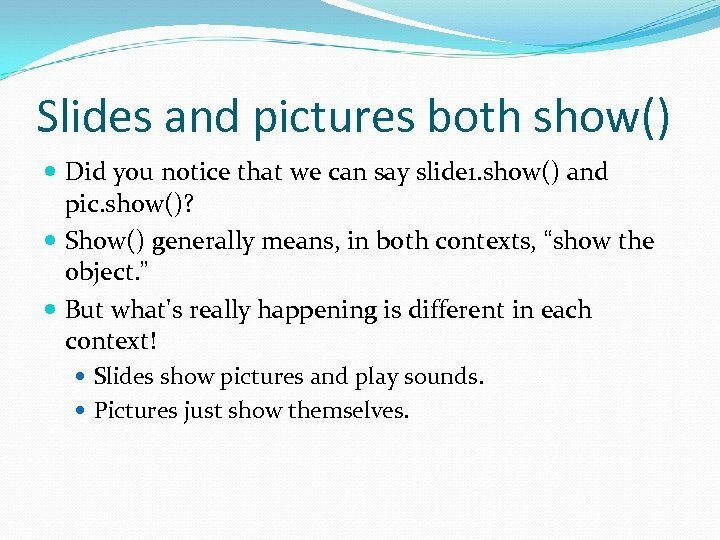 Slides show pictures and play sounds. Pictures just show themselves. 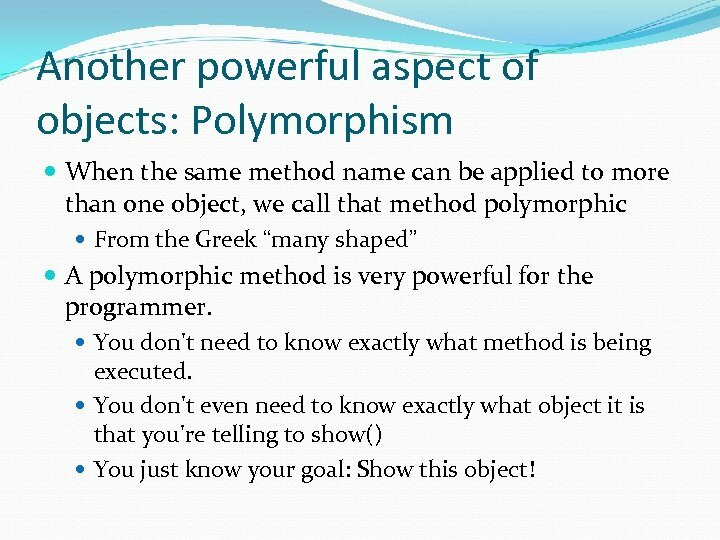 Another powerful aspect of objects: Polymorphism When the same method name can be applied to more than one object, we call that method polymorphic From the Greek “many shaped” A polymorphic method is very powerful for the programmer. 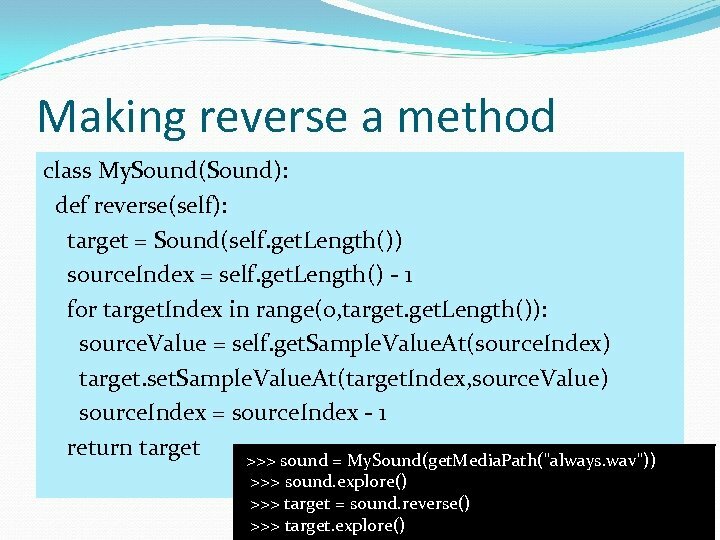 You don't need to know exactly what method is being executed. You don't even need to know exactly what object it is that you're telling to show() You just know your goal: Show this object! We can get/set components at either level get. Red, get. Blue, get. Green, set. Red, set. Blue, set. 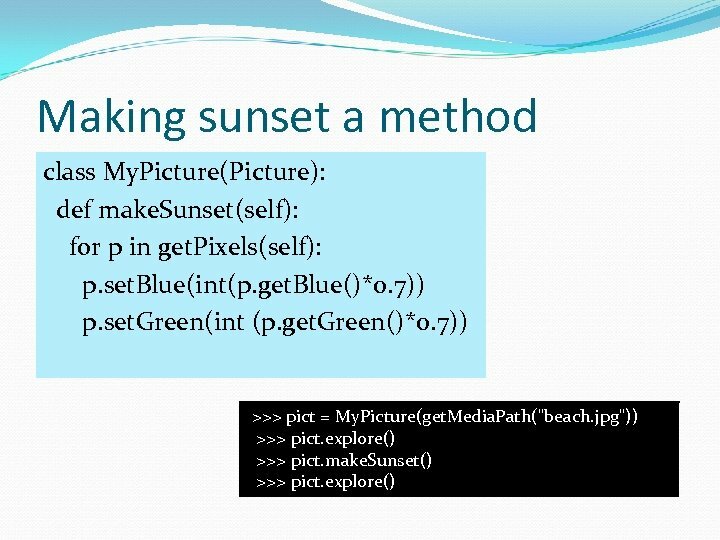 Green Are all defined for both colors and pixels Why didn't we define the functions to work with either? 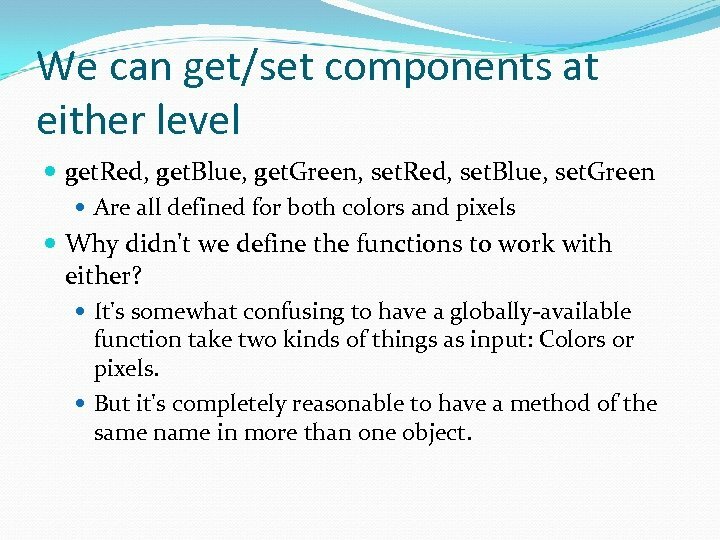 It's somewhat confusing to have a globally-available function take two kinds of things as input: Colors or pixels. But it's completely reasonable to have a method of the same name in more than one object. 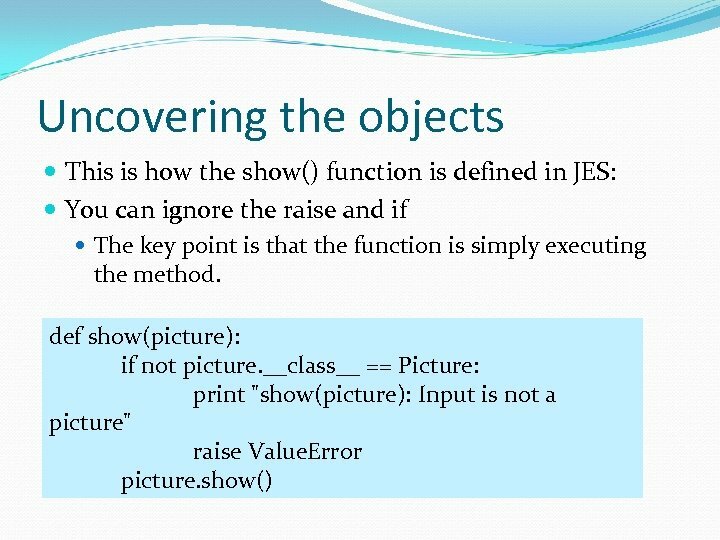 More methods than functions In general, there are many more methods defined in JES than there are functions. 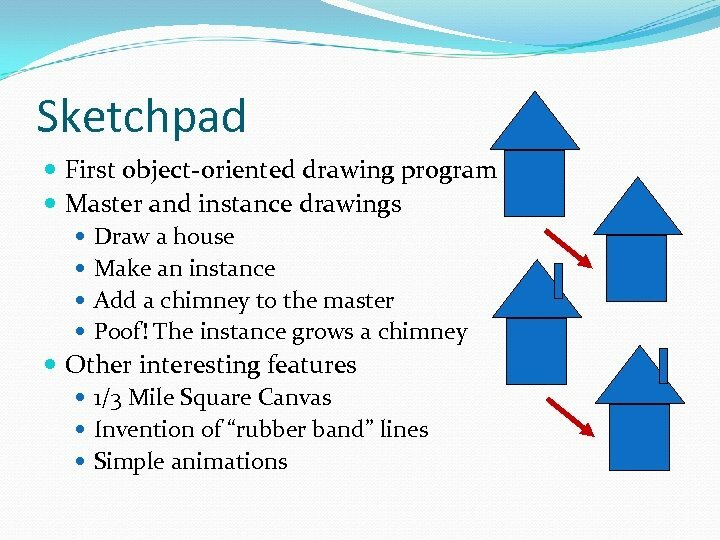 Most specifically, there a whole bunch of methods for drawing onto a picture that aren't defined as functions. We simply ran out of time/energy to convert them all into functions. 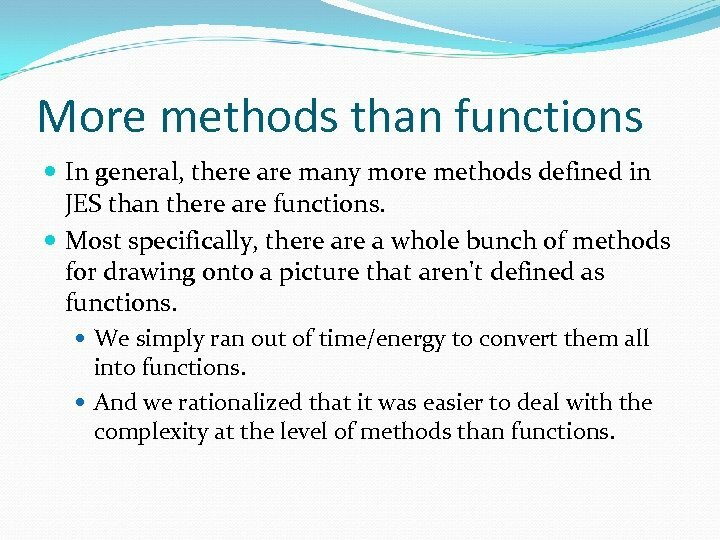 And we rationalized that it was easier to deal with the complexity at the level of methods than functions. Rectangles: Coloring lines and fills >>> pic=make. Picture (get. Media. 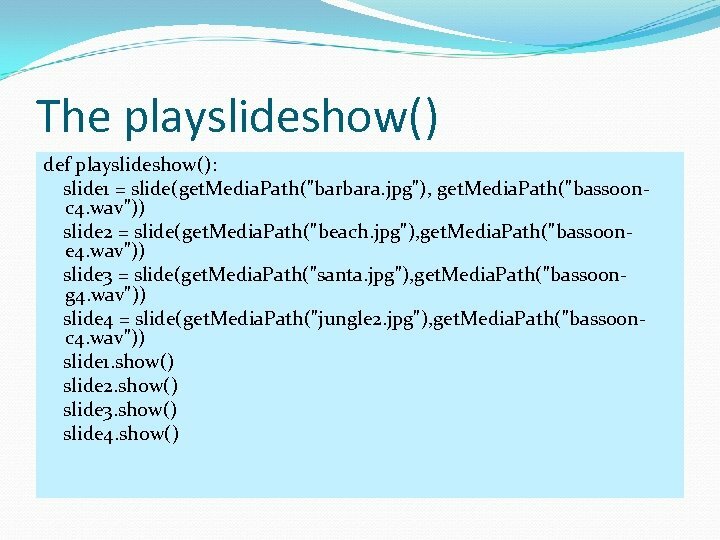 Path("640 x 480. jpg")) >>> pic. add. Rect. Filled (orange, 10, 100) >>> pic. add. Rect (blue, 200, 50) >>> pic. show() >>> pic. write. To("newrects. 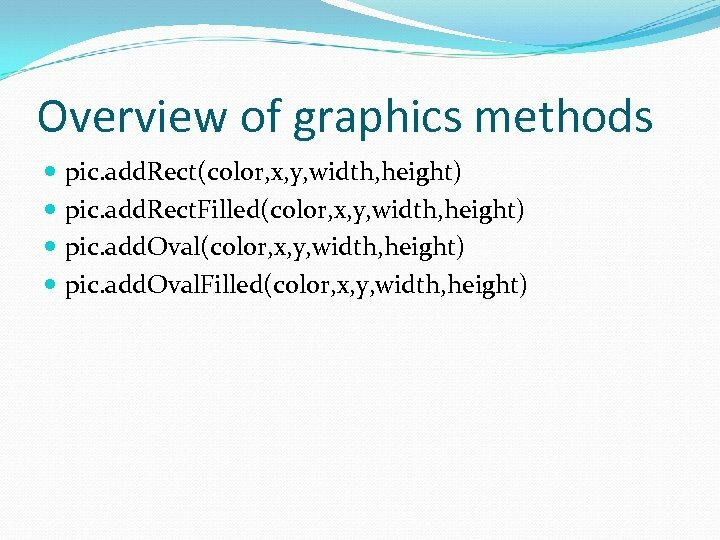 jpg") write. 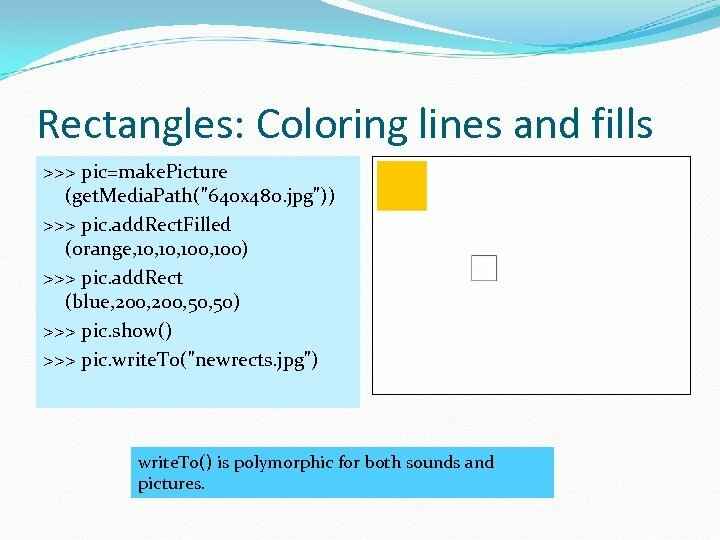 To() is polymorphic for both sounds and pictures. 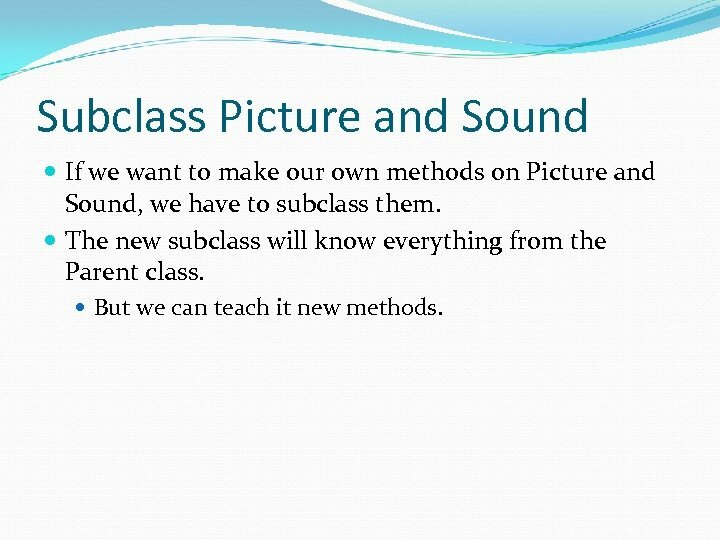 Subclass Picture and Sound If we want to make our own methods on Picture and Sound, we have to subclass them. The new subclass will know everything from the Parent class. But we can teach it new methods. 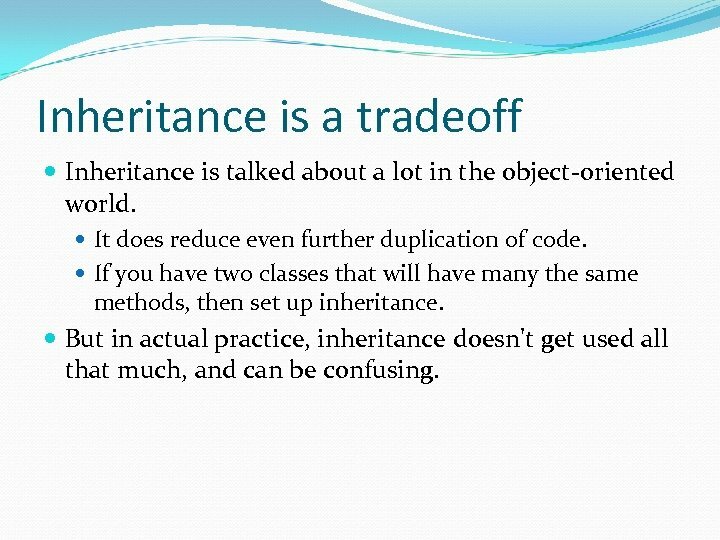 Inheritance is a tradeoff Inheritance is talked about a lot in the object-oriented world. It does reduce even further duplication of code. 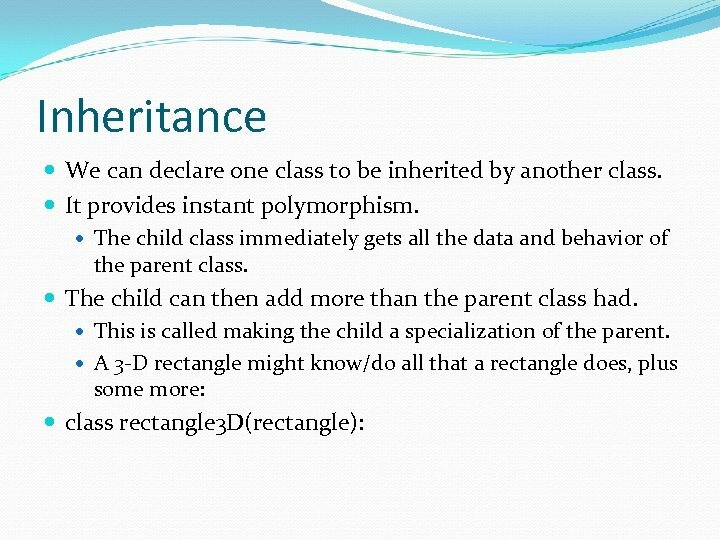 If you have two classes that will have many the same methods, then set up inheritance. But in actual practice, inheritance doesn't get used all that much, and can be confusing. 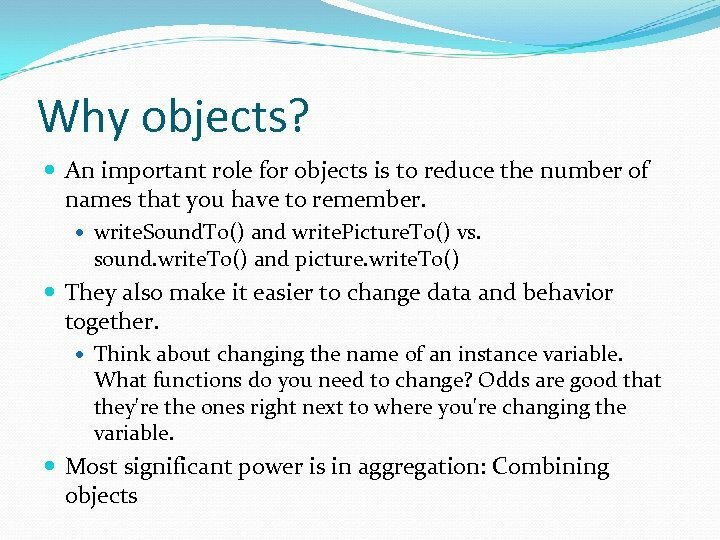 When should you use objects? 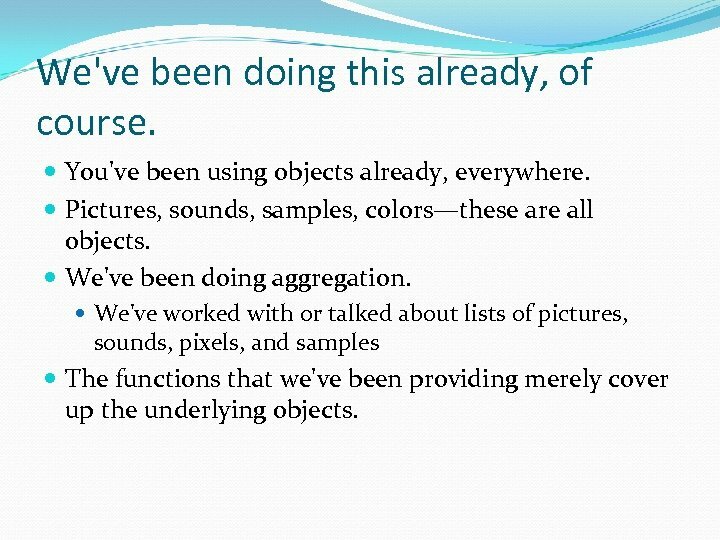 Define your own objects when you have: Data in groups, like both pictures and sounds. Behavior that you want to define over that group. 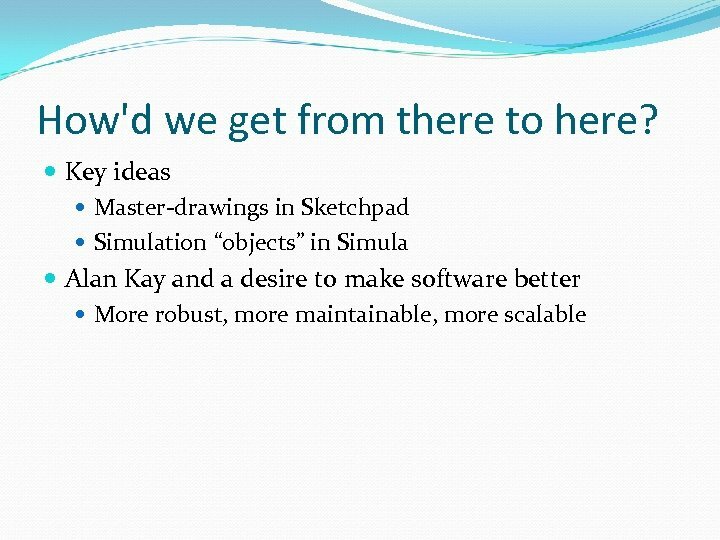 Use existing objects: Always—they're very powerful! 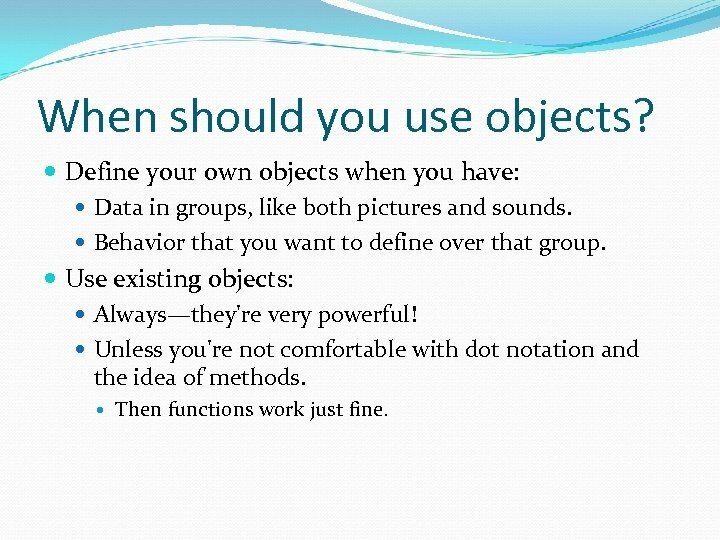 Unless you're not comfortable with dot notation and the idea of methods. 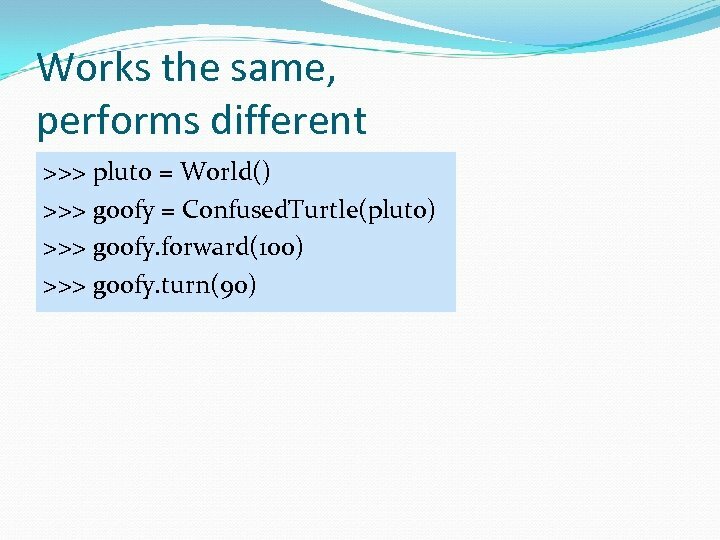 Then functions work just fine.